We have looked at what happened when Rome took over civilizations that were older than Rome’s own, and arguably even more advanced than Rome’s own. And what happened, of course, was an interesting mix between the architecture and the architectural forms that the Romans brought with them, and what they found in these highly developed civilizations, and the interesting mix that came about because of that. But we’ve also taken a look at what happens when Rome went out and created cities essentially from scratch, built cities where there had been no cities before. And what happened as a result tended to be cities that looked very much in the Roman stamp. And we’re going to look at a number of those cities today, in the western provinces of the Empire, in fact, to see what happens again when Rome builds cities from scratch in that part of the world, and, as I mentioned already, the distinctive stamp, this distinctive Roman stamp that they had. But at the same time there is always some impact from the local civilization, and to mention in passing that, at least in the part of the world that we’ll be concentrating on today, especially in Gaul, ancient Gaul, the Celtic tribes were foremost there, and we do see that some of the impact of those tribes makes itself felt, as well as tribes in other parts of this part of the ancient Roman world. Just as a reminder, I want to show you again a couple of the monuments that we looked at last time, when we were talking about Greece and about Athens under the Romans. 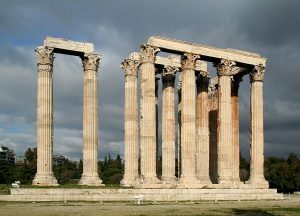 And I remind you, for example above, of this Temple of Olympian Zeus, the Olympieion in Athens, which was begun already in the Archaic period, the Greek Archaic period, continued to be built up–those, the patrons tried to complete it, in the course of the Hellenistic period into the Augustan period, and ultimately, as you’ll remember, it was completed under the emperor Hadrian. So a building with a very long history and a very distinctive style. And when it was completed under Hadrian, of course, you’ll recall that it looked entirely Greek — very similar to what it would have been in the Hellenistic period. So those–again, the Greeks holding very tenaciously to their own plans, to their building materials, and indeed to the kinds of architects and artisans to carve them, that had been carving them for centuries. 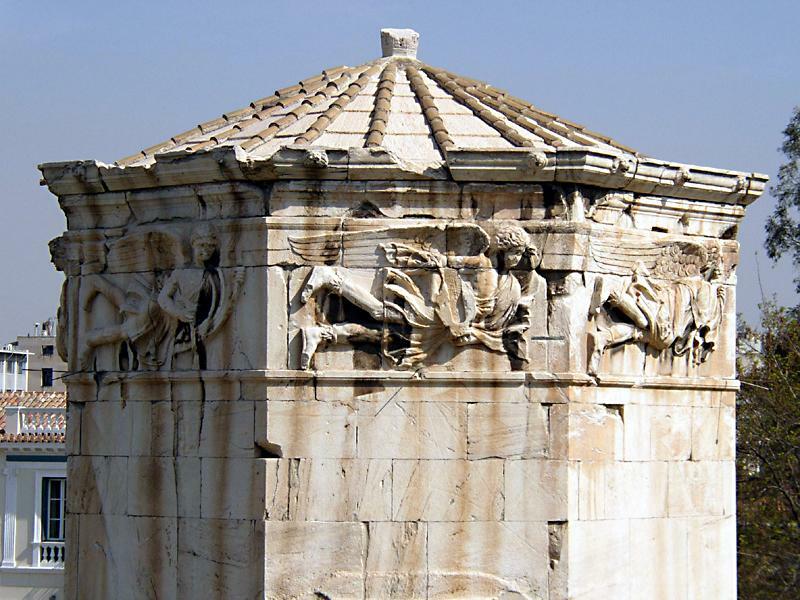 We also took a look at the building above, which is the Horologion of Andronicus, or the Tower of the Winds. And you’ll remember in this case that the civilization that had impact on it was another firmly entrenched civilization and that is that of Egypt. We talked about the fact that while the date of this monument is controversial–it might be second century B.C., it might be Caesarian, or even into the Augustan period–it’s controversial, but we talked about the fact that even though the date is controversial, that the monument itself was built under very strong influence from Ptolemaic Egypt. The Ptolemaic Egyptians particularly intrigued, for example, by clocks–this was a water clock, as you’ll remember–and by these abstruse, identifications of abstruse winds, male winds, that we see in the uppermost part. 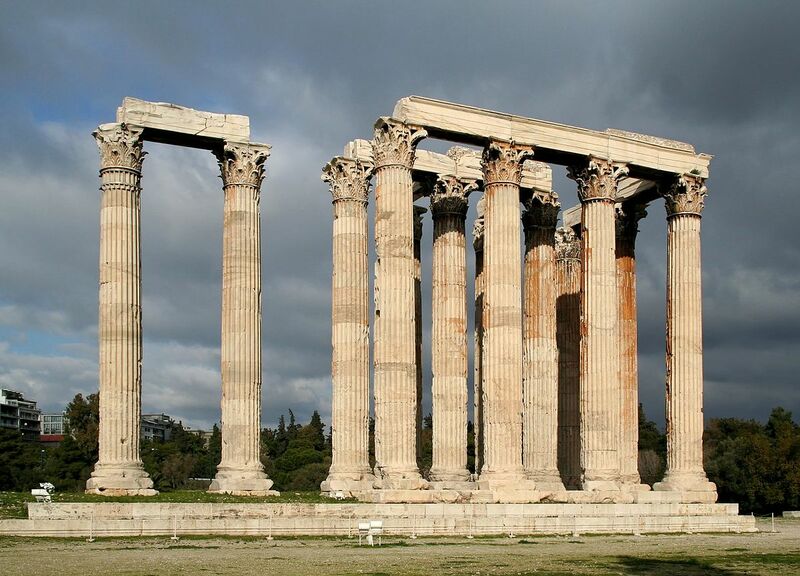 So again, the impact of two very high civilizations–the Greek civilization and the Egyptian civilization–on Roman architecture in the eastern part of the world. 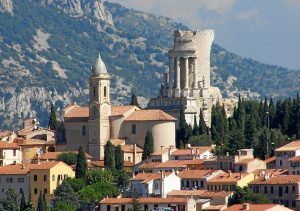 Today we’re going to go west, and we’re going to look at Roman architecture in a variety of places, including–and some beautiful places–including the south of France: a series of cities–and I’ll point those out to you in a moment–in the north of Italy. So the north of Italy, the south of France, into Spain, into what is now Spain. And then also we will dip into an area called Istria, which is the uppermost part of what is now Croatia, where a place by the name of Pola is located. So those western provinces will be the area that we’re going to concentrate on today. Now any of you who’ve traveled in this part of the world know that it is extraordinarily beautiful. And I show you just one example of that. When you go along the French Riviera, for example, you see places as sophisticated as Monte Carlo, with its yachts moored here, and of course with its glittering nightlife and its extremely famous casino, the Casino at Monte Carlo. 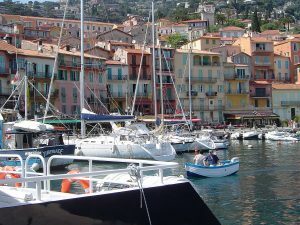 There are also other wonderful cities to visit along here, modern cities, such that of Villefranche, which you see here, and its fabulous pastel colored houses, with boats that are not quite as magnificent as those at Monte Carlo, but nonetheless very picturesque, a wonderful place to visit. So it’s not a hardship to have to travel and look at Roman antiquities in the south of France. I want to begin though with northern Italy, with a city in the north of Italy, a city at a place called Aosta. A city that was founded by the Romans in 24 B.C., in the time of Augustus. And therefore it won’t surprise you to hear that its ancient Roman name was Augusta Praetoria: Augusta Praetoria, the modern city of Aosta. And it was the last colony that the Romans founded in Italy; the last colony. 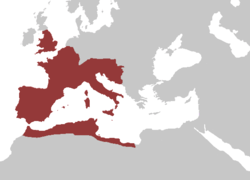 And it’s interesting to see therefore that this last Roman colony in Italy takes almost exactly the shape of the first Roman colony in Italy. You’ll remember the city of Ostia, which the Romans founded in 350 B.C., and the way in which it conformed to the typical castrum plan. We see the same thing here. We see this typical castrum plan for Aosta: a rectangle, a regular rectangle, laid out according to Roman surveying practice. We see that the two major streets of the city, the cardo and the decumanus, meet in the center, and that at that intersection of those two main streets we see the location, as it should be, of the forum, most likely. You’ll see a question mark there, so we’re not absolutely sure, but we think that the forum was located there. If you look around at the rest of the city, it was very regularly laid out, with a series of buildings that we’ve become accustomed to seeing in a typical Roman city, when a typical Roman city is built from the basics. You see the baths here. You see a temple up there, with a cryptoporticus. You see a theater and you see an amphitheater. This site, by the way, spectacularly located in the Italian Alps. It’s at the intersection of two major trade routes, in the St. Bernard passes, as you can see from this plan that comes from Ward-Perkins. And what you can also see, that’s typical of these cities that the Romans build from scratch around the western part of the Empire, is the fact that the city is ringed with walls, and that it has a series of gates, the openings of which you can also see in this excellent plan. 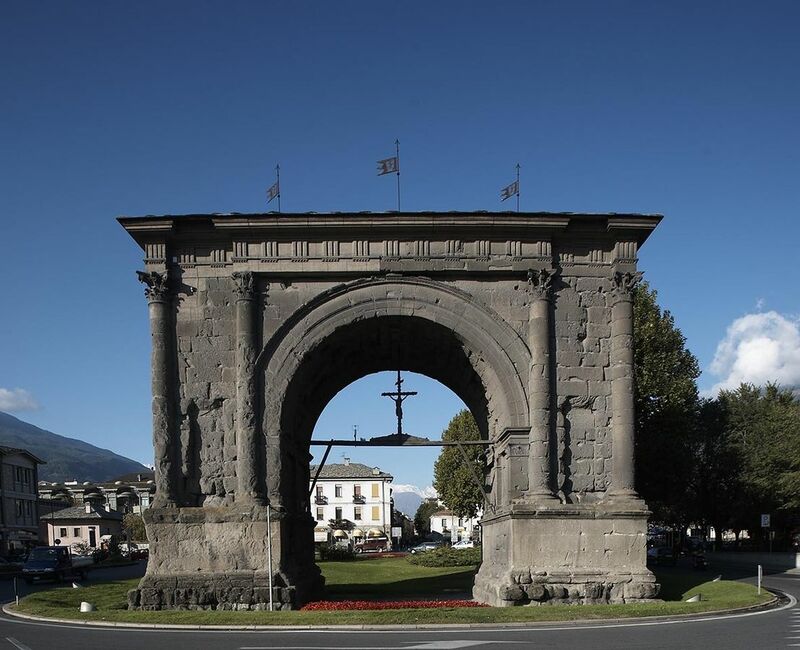 Now I can show you also from the city of Aosta a surviving Roman arch, one of those gateways in fact, from the city, that we know dates to the age of Augustus. So we give it a date, the same date, roughly 24 B.C. You see it here. You see, if you remember the arches that we’ve discussed from the Augustan period in the past, you’ll note right off that this is very consistent with other Augustan arch design. By that I mean it has one single arcuated bay, in the center, flanked on either side by pedestals, wide pedestals that have a set of double columns on either side, as you can see here. 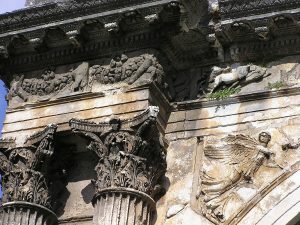 The major difference between this and an arch that might have been put up in Rome at the same time, in the Augustan period, is the fact that it is made out of local stone, which is characteristic of so much of provincial Roman architecture, and will be the case for most of the buildings that we look at today. The attic is gone. There’s a modern roof on top of the structure. The ancient attic is gone. But you can imagine that it would’ve had a fairly traditional attic, with an inscription at the apex and probably some kind of sculpture crowning the monument in antiquity. Now there’s one detail that has to do with the orders that are used here that is different from any other arch that we’ve seen before. These are in the Corinthian columnar order. But what’s different here are the triglyphs and the metopes that tend to accompany the Doric order, not Corinthian. So this is very interesting. We see this mixing of the orders here, the use of Corinthian columns but a Doric frieze with triglyphs and metopes. You’d never see that in Rome itself. But what it is, is an interesting playing around with the canonical orders that have been passed from Rome to this part of the world. This particular architect or patron, or the city itself, whoever was the patron of this particular monument, made the decision to go in a somewhat different route. So an interesting mixing of the orders — an eccentric arch in that regard, but in every other conforming quite closely to what we would see in Rome, the city of Rome contemporaneously. 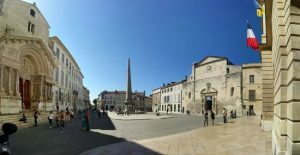 I want to go from Aosta, in the north of Italy, to the south of France, to Provence, to take a look at the original town plan of the city of Arles, the well-known city of Arles. And those of you who know it, or have been there, know it probably primarily as the city of Vincent van Gogh. It’s in the city of Arles he spent a good deal of time. He went to this particular café so often that it has borne his name for some time, the Café Van Gogh. And you see another view of a lovely piazza in the city of–or plaza in the city of Arles. 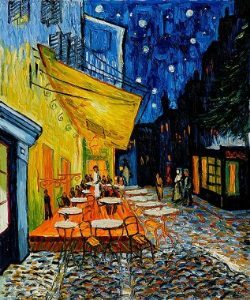 And then the famous painting of Van Gogh, the panting that he made of this particular café, that he used to spend so much time in, a café again, as you see here, that is still there, and where you can yourselves go and sip an aperitif or whatever. 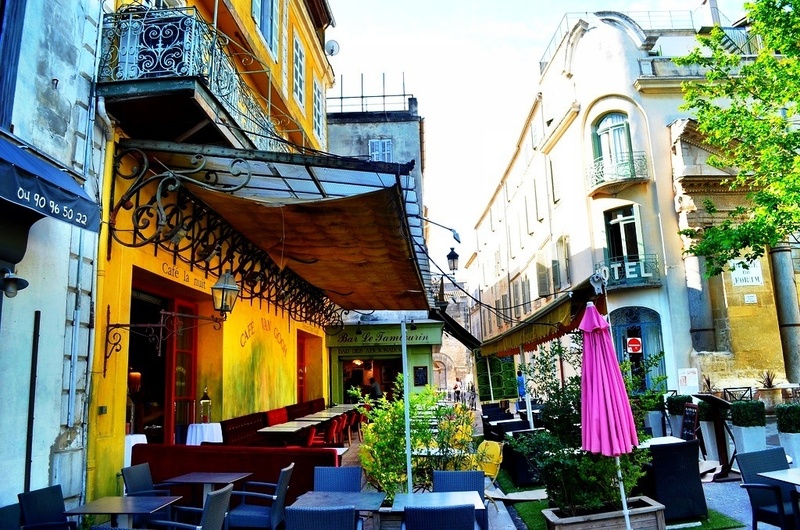 This part, the city of Arles, a wonderful place to go. It has a very–I’m not going to show it to you in any detail, just a glimpse here of its famous amphitheater. 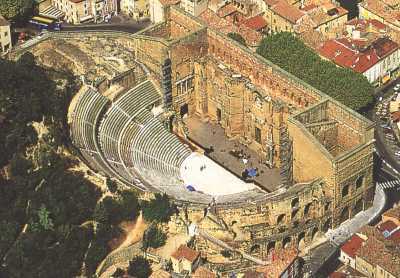 It has a very well-preserved Roman amphitheater. And the fact that France is so close–as you can see in that map I showed you before–to Spain, has led to quite a bit of Spanish influence coming into this particular part of France. And this amphitheater is used today not only for other kinds of performances, but even for bullfights, as you see. 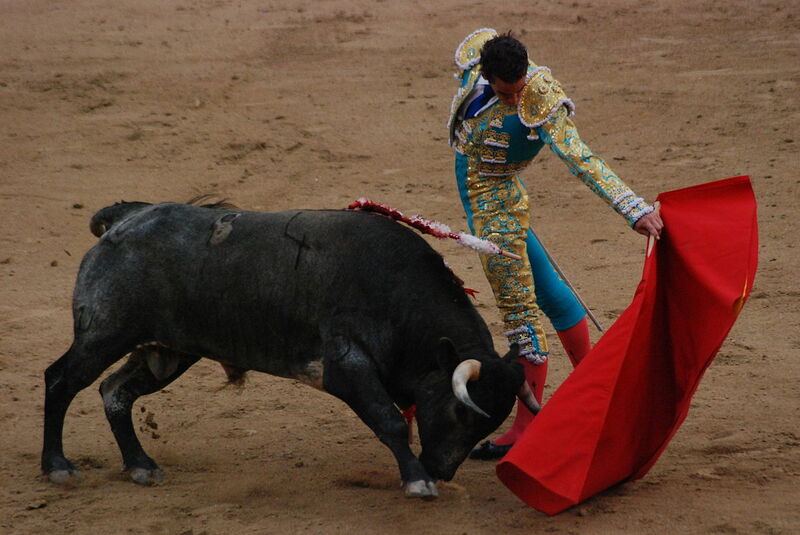 This is actually a bullfight in Madrid, not in Arles, but nonetheless it’s the sort of thing that has been performed even in the Amphitheater at Arles. I want to remind you of these towns in relationship to one another. So we’ve come up from Rome. We’ve looked at Aosta in the north of Italy, in the Alps. 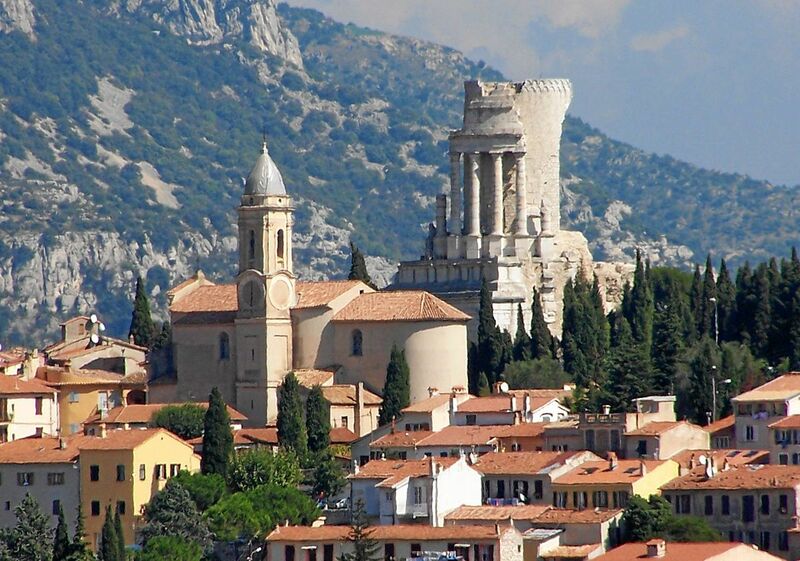 We’re making our way now into the south of France. And I wanted to point out the proximity of northern Italy with the south of France. Because we do believe that a lot of the impact of Rome was felt through the–on south of France, or what is now the south of France–was passed through the intermediary of the north of Italy; that there were certain kinds of architectural forms that were developed in the north of Italy that were transferred into the south of France, because of the proximity of one to the other. 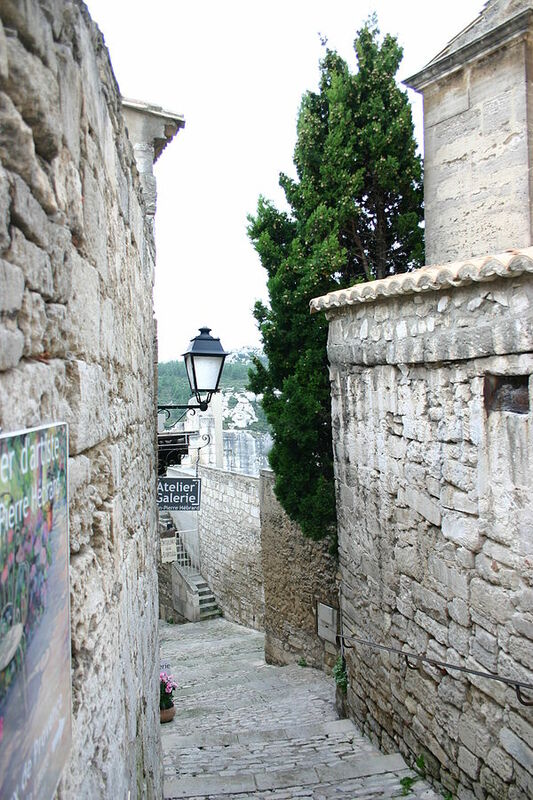 We’re going to be looking at Arles. 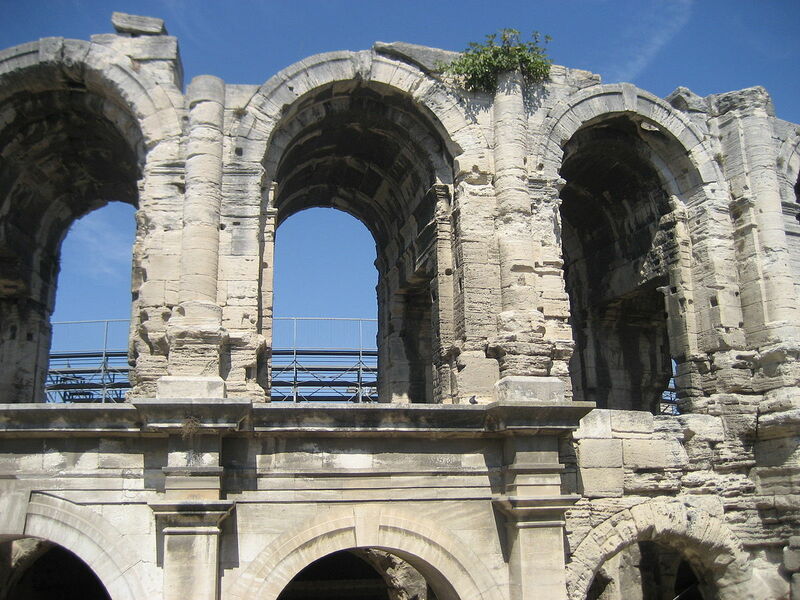 We’re going to be looking at Nîmes. We’re going to look at a building in La Turbie. 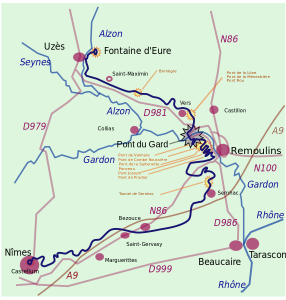 We’ll be looking at Saint-Rémy, and at Orange, the great theater at Orange, as well as a temple at Vienne — so all of those sites. We’re going to dip into Spain. 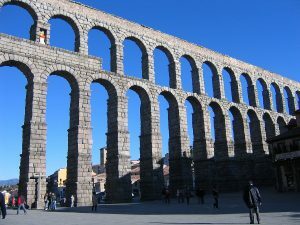 We’re going to look at a famous, famous, spectacular aqueduct at Segovia, and a less spectacular but very well-preserved aqueduct at Tarragona. 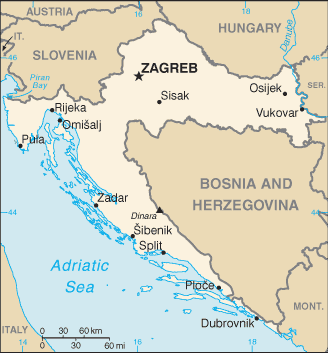 And then we’re also going to make our way, as I mentioned before, into Istria, part of what was formerly Yugoslavia, to the site called Pola, that is now in, as you know, Croatia. 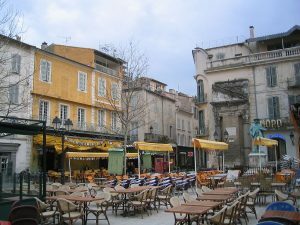 I want to begin with the city plan of Arles, as it would’ve looked in ancient times. 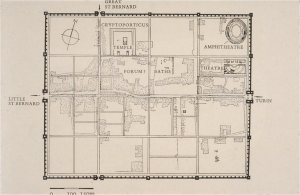 And I show you here the city plan of–excuse me, not the city plan, I want to show you the forum, to give you a sense of what fora looked like in the western provinces during this period, especially in Gaul. 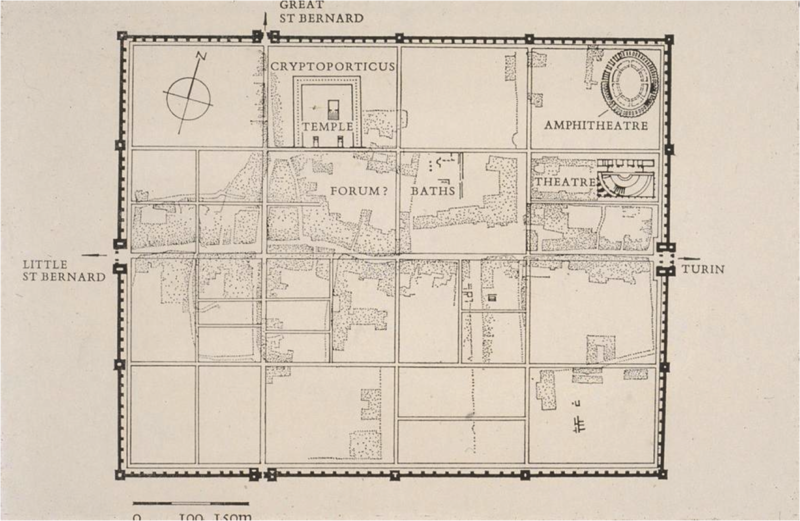 I want to show you the forum plan of the city of Arles. And I show it to you here, with the modern streets superimposed on top of it. Because much of it is underground; you can’t see too much of it today. 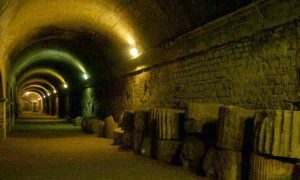 But it has been explored underground enough where scholars have been able–archaeologists have been able to reconstruct the fact that it was a large open rectangular space, surrounded by columns, as we have seen is characteristic of all Roman forum design, from the Forum in Pompeii that we looked at at the very beginning of this semester. And although you can’t see it on this particular plan, there was also a temple on one short end, as well as a basilica that was part of this plan. And I think it’s interesting to think back, especially as you review from what we’ve done from the midterm through the second midterm, it’s interesting to think about basilican architecture, because it was usually a part of forums, and when it was a part of–and in what buildings, in what fora it was incorporated: think back to Pompeii, think to the Forum of Trajan in Rome. But think of the fact that both the Forums of Julius Caesar and the Forum of Augustus in Rome did not have basilicas as part of them. 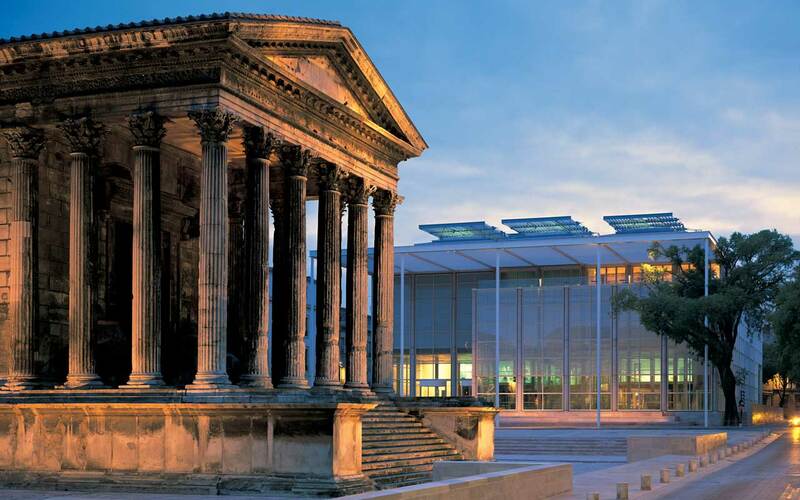 Here already in the Augustan period in–because that’s when this dates–in the Augustan period we see a basilica incorporated into the forum plan, in what was ancient Gaul. 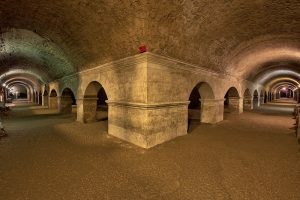 I mentioned that there’s a well-preserved–there’s a well-preserved cryptoporticus, an underground storage area, around the colonnade. And you see a view of it here: extremely well preserved. And it should remind you of those cryptoportici that we looked at very early in the semester at the sanctuaries that we explored: the sanctuaries, you know, at Tivoli and Hercules Victor; Hercules Victor at Tivoli and Jupiter Anxur at Terracina, for example; very similar with its barrel-vaulted corridors. This one was used for storage within the forum. So they would store salt and fuel and other items that they would need for daily use. But it also became eventually–and you can get an inkling of that from the bottom two pictures–it eventually became a dump for architectural members that were no longer needed–as you can see here, columns and capitals–but also for sculpture. And one of the most famous portraits of the emperor Augustus was found in this cryptoporticus, dumped there at some later period, and it’s now on display in the Archaeological Museum in Arles. I want to turn now to the Theater at Orange, which is one of the most spectacular monuments that I’m going to show you today. And you see it in this extraordinary view from the air, put up in the late first century B.C., early first century A.D., and it is really something special, not only in its own right, but also because of how well preserved it is. And you can see in this view not only the typical scheme that we have seen, we’ve become accustomed to, for Roman theater design: the semicircular orchestra; the semicircular cavea; the division into these wedge-shaped sections or cunei; the outer wall of the structure. And you should be immediately struck by this outer wall of the structure, because the outer wall of the structure is better preserved than any other outer wall that we’ve seen in the course of this semester. It’s preserved to its full height. It is very severe, but that severity would have been lessened in antiquity by the incorporation of a colonnade on the front of the structure. So this very important building, in that regard, because we again have this very well-preserved wall, which gives us a good sense of what these walls would’ve looked like in antiquity. And you have to imagine here again that alleviation of this severity by that portico. 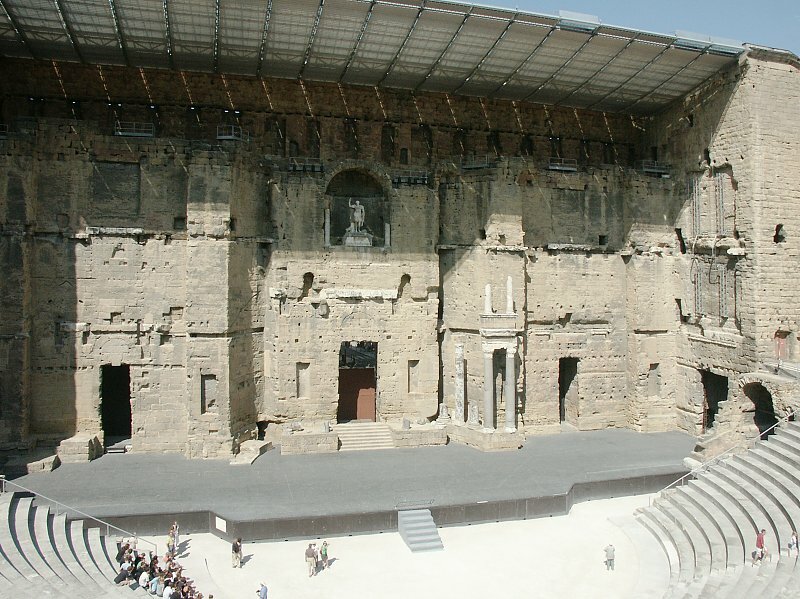 You can also see here though something very interesting about this particular theater that makes it connected–although it’s Roman in every way–that connects it also to earlier Greek theatrical architecture. Because you’ll remember that the major difference between Roman theaters and Greek theaters was that Romans built their theaters on their own hill, made of concrete, but the Greeks built their theaters on actual natural hillsides. And if you look very carefully at this excellent view from the air, you will see the way in which this particular theater, at Orange, is actually built into a hillside. They happened to have a natural hillside perfect for this kind of construction, right where they wanted it to be. So they took advantage of that hillside and they placed–they supported the cavea of this structure by that hillside, as you can see extremely well. The interior of the Theater at Orange is also extremely well preserved, as you can see here. You can see the stage. You can see the semicircular orchestra. You can see the stone seats of the cavea, and you can also see that the stage building–and because the wall, the outside retaining wall is so well preserved, you can also see that the interior of the wall still stands, obviously. And this wall had one giant niche in the center, with a projecting element also in the center, and then would’ve had three tiers of columns, one on top of one another. 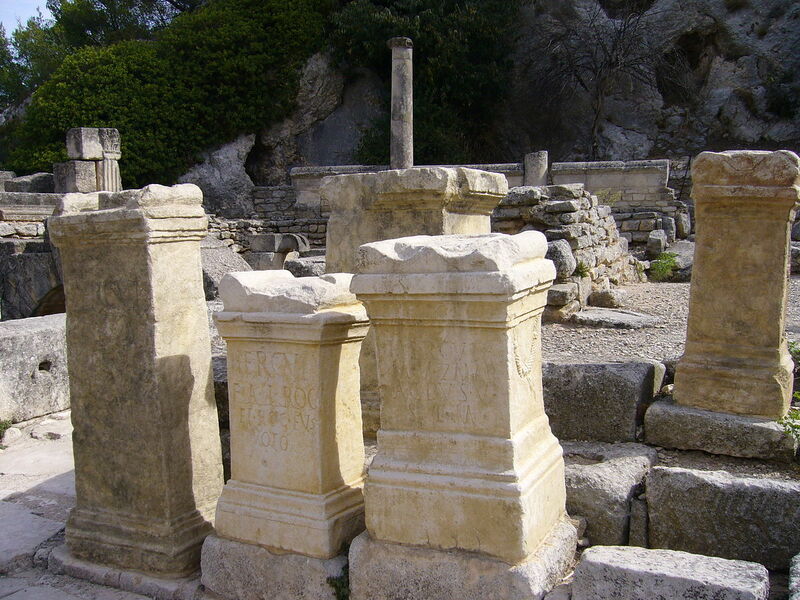 Most of those are unfortunately no longer there, but you can see one set of two pairs here–the lowest tier with two columns, the upper tier with two partial columns above that–which gives you some sense of what this would’ve looked like in antiquity. Again we think the tiers, the columns, were on three stories. Remember the date of this, late-first century B.C. probably. And so this does post-date some of the 60 to 50 to 40 B.C. paintings that we looked at that show these kinds of multi-storied, scaenae frontes with columns. We speculated about the fact that some of those may have been based on actual theatrical architecture, but that it didn’t survive from that early on, but it may have been made out of wood. But here we see a fairly early example, in the Augustan period, in the south of France, and it is very important in that regard. I want to turn from theater architecture in the western provinces to temple architecture. And just as in Rome, and just as in every city that we’ve looked at, temple architecture was extremely important. 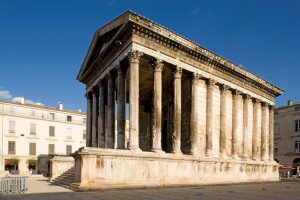 The temples that I’m going to show you–and I’m going to show you two of them, one at Vienne, in France, and one at Nîmes, also in France–are among our best preserved Roman temples today. And it’s important to keep in mind that both of them were part of complexes. They stand in isolation today, but in antiquity they were part of a complex — probably some kind of forum or central space for that city. This is the one at Vienne, which I show to you first, that dates to, probably to before A.D. 14. And it is a temple that was put up to Augustus and Roma. It may have been–the dedication may have been changed to Augustus and his wife Livia, at some point; we’re not absolutely sure. But you see it here in a very good general view of what it looks like today. It’s one of these buildings that has been preserved in large part because it has been used–for later purposes. It was used as a marketplace. It was used as a museum at one point. And that is what has helped to preserve it. We see it again here, and it’s interesting, I think, to compare it to the restored view of the Temple of Mars Ultor that was part of the Forum of Augustus in Rome, because the dates are roughly comparable to one another. 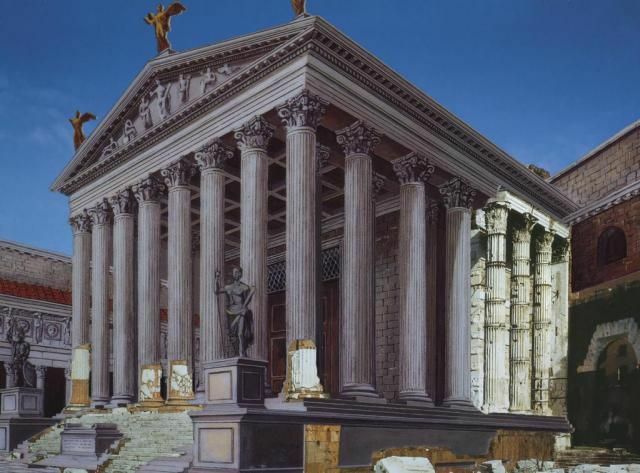 And I think that you will see that it is a typical Roman temple, in fact, almost indistinguishable from what we would see in Rome at the same time. So here’s an example again of what happens when you go–when the Romans go into a part of the world that isn’t already inhabited by a very highly developed civilization, that they make buildings that look very similar to those that were put up contemporaneously in Rome. The Temple at Vienne is no exception. If we look at this temple, we see it has the typical Greco-Roman plan with the tall podium, the deep porch, the freestanding columns in that porch. And we see that the order that is used here is the Corinthian order. Some of the temple is made out of local limestone. Some of it is made out of marble. 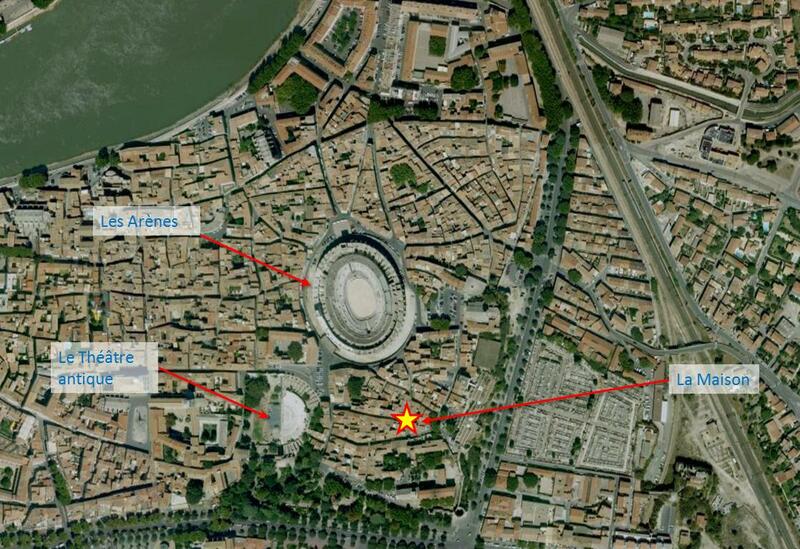 But what we see here that’s very interesting vis-à-vis what was happening at the same time in Rome is the cella. You can see that the cella is actually very shallow, much more shallow than the cella usually is; and you can see that quite well in this view over here. And that same shallow cella we find at the Temple of Mars Ultor in Rome. 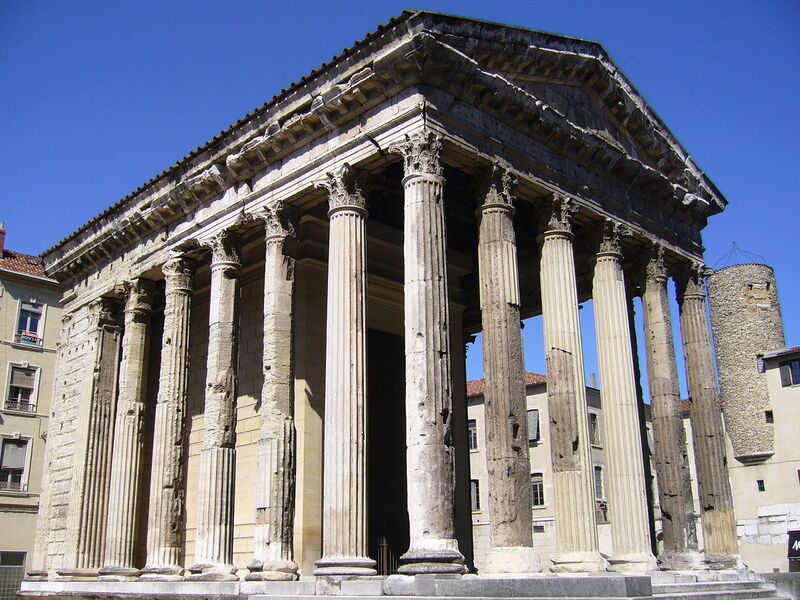 The other similarity is the fact that at the Temple of Mars Ultor in Rome we have freestanding columns–columns all the way up to the back here–and those columns–and there’s space between those columns and the wall of the cella. And that creates a type of temple design that we refer to today as a temple with alae or wings; wings one on either side of the cella, formed by that space between the wall of the cella and the freestanding columns. And we see exactly the same thing over here, this design of a temple with alae. There is no question that this temple in Vienne was built under the very strong influence of the Temple of Mars Ultor in Rome — all of those features–I mean, they wouldn’t have come upon those features by accident; it is clearly being closely based one on the other. Here are two more views of the Temple of Augustus and Roma/Livia at Vienne, where we see all of the features that I’ve already shown you, but where you can see particularly well the shallow cella, the plain–the back wall here that has pilasters rather than columns. And then if you go around the back you will see it has a plain flat back, which was the case also for the Temple of Mars Ultor in Rome. A more famous temple, an even more famous temple, if that’s possible, an even better preserved temple, is the one that you now see above, which is the famous Maison Carrée at Nîmes. It too, it too has been reused in ancient times as a museum and the like. It’s still a small museum today, which is one of the main reasons that it is so well preserved. It is an extraordinary work of Roman architecture. 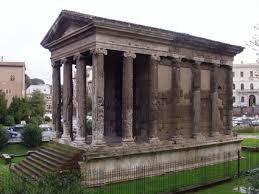 I think it’s interesting to compare it to the Temple of Portunus that we saw much earlier this semester. The major difference, of course, between the two, the materials that are used. This is local limestone with marble. 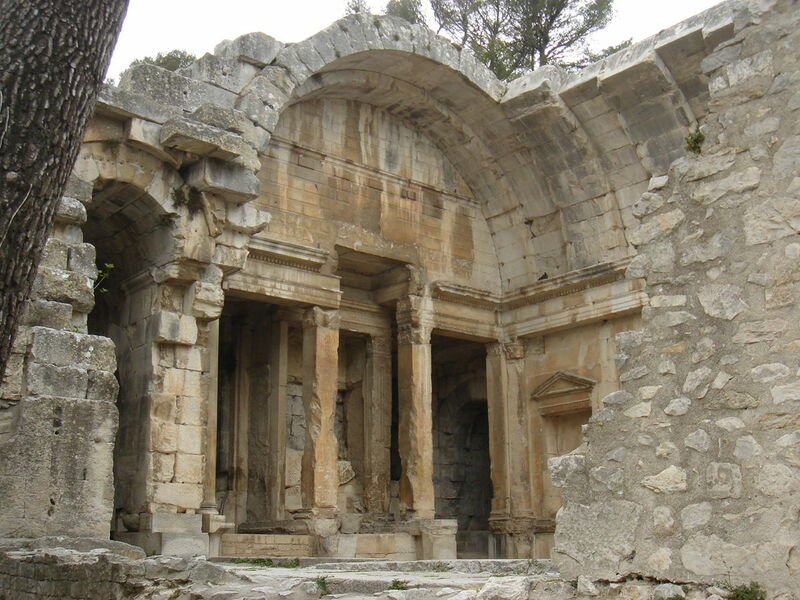 This–well we won’t remind ourselves, but tufa and travertine and so on and so forth, that we looked at earlier–this is an Ionic temple; this is a Corinthian temple. 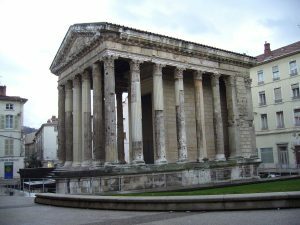 But once again it seems to be the Temple of Mars Ultor that was the main model for the Maison Carrée or the Square House at Nîmes. 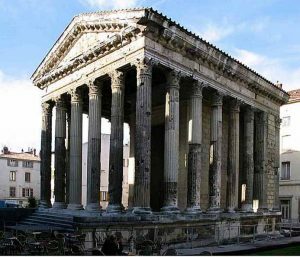 You see, just like the Temple of Portunus (above), it has a pseudo-peripteral colonnade, and you can see that extremely well. Yes, the columns encircle the entire monument, including the back wall, but those columns are engaged or attached to the wall going all the way around. 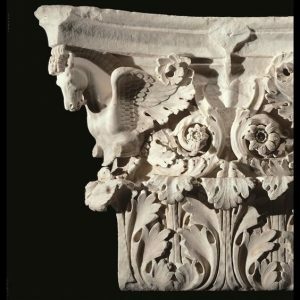 Here you can again see the opus quadratum blocks of this local limestone that’s used for the walls, and then marble used for the columns and also for the capitals of this glorious and very well- preserved Roman temple. 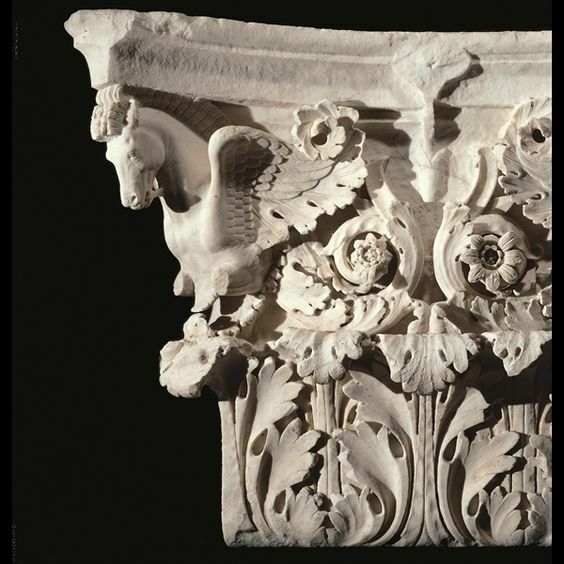 And here some spectacular details of the capitals of the Maison Carrée at Nîmes, and the frieze, and also the decoration up above. And what’s interesting about these capitals, if you look at them in detail you will see that not only are they Corinthian, and we can see the spiral volutes growing out of the acanthus leaves down below, but if you compare these capitals to a capital, a preserved capital from the Temple of Mars Ultor in Rome, you will see that not only are these based on these, but that they are so close, so close, that there is absolutely no question, I believe–well this was not suggested by me but by a scholar who studied these in great detail and determined and suggested, and all of us have believed it ever since–that these are not only based on those, but that the same workshop worked these capitals for the Maison Carrée as for the Temple of Mars Ultor in Rome. You see this flowering acanthus plant, that should immediately remind you of contemporary decoration in Rome; think of the flowering acanthus plants of the Ara Pacis Augustae. 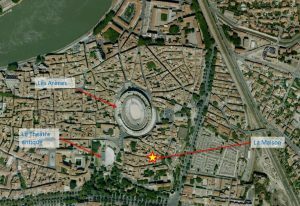 So once again proof that there is a very close connection to what’s going on in Rome at this time, and in the south of France. Now that works well chronologically, because you’ll remember that the Temple of Mars Ultor in Rome was dedicated in 2 B.C. This building, as you can see from your Monument List, was built in around A.D. 5. 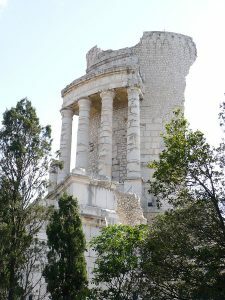 So there was perfect–it was perfect timing for those architects and artisans who had been successful at the Temple of Mars Ultor in Rome, this major commission, allowed themselves, we believe, to be hired out to those in the south of France, to make the trip to Nîmes in order to build a temple in the model of the Temple of Mars Ultor in Rome, at Nîmes; the result, the Maison Carrée. So this is–I’ve made this point in other lectures about the fact that there are certain times when we can document not only the exchange of architectural ideas but even the exchange of architects and artisans, going from one part of the Roman world to another, in search of commissions. And this is one of those times where we can document with certainty that artists working in the employ of the emperor himself, Augustus, made their way to the south of France to create this amazing temple from scratch. 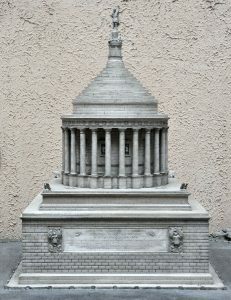 Once again, a temple very much in the model of the most famous temple of its day in Rome, and that is the Temple of Mars Ultor, in the Forum of Augustus. Here’s another spectacular view of the Maison Carrée, as it looks in its location today. In the center of a plaza, surrounded by the daily life of Nîmes, as you can see so well here — still very much a part of daily life. And very interesting is the fact that if you look across the street, from the Maison Carrée, you see a building that was designed by the very famous and very talented British architect, Norman Foster. It’s also a museum, and it’s a play on the name of the Maison Carrée, it’s called the Carrée d’Art. 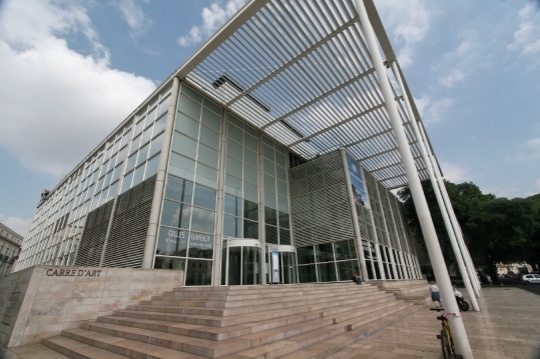 It’s a museum that has modern art, and it mostly exhibits its permanent collections. 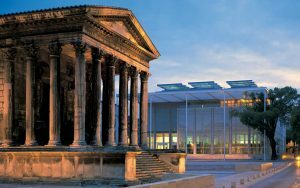 But you can see–and I’m going to show you a detail in a moment to bring this point home–you can see that Norman Foster has really looked at, and studied, the Maison Carrée, and has created a modern version, a very modern version of the Maison Carrée. 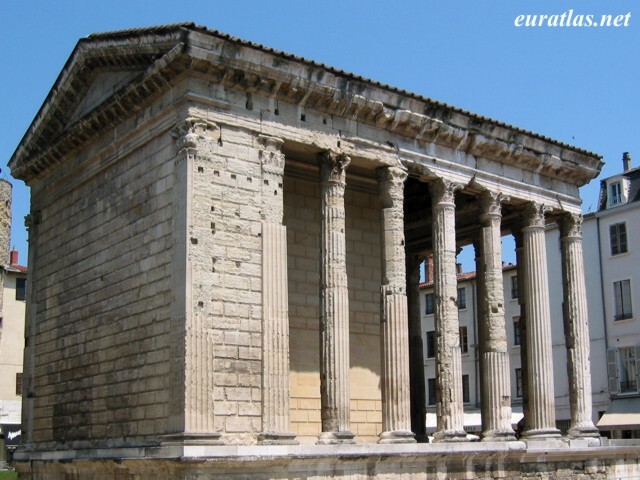 If you look at the Maison Carrée and its deep porch and its high podium and its single staircase, this façade orientation, all the usual Roman elements, and look at this building, you will see that he too has created a kind of portico in the front. 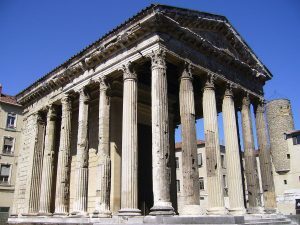 They’re not actual columns, they’re piers, but piers–and very slender and elegant piers–but piers nonetheless that are clearly being played off the columns of the Maison Carrée. And look at the way in which he has done the glass exterior. 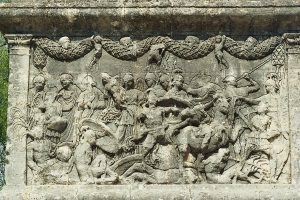 He has divided it into a series of panels that are clearly, I believe, reflecting–and I’m sure he knew he was doing this at the time–clearly reflecting the panels of the ashlar masonry of the walls of the actual Maison Carrée. So this is very interesting. 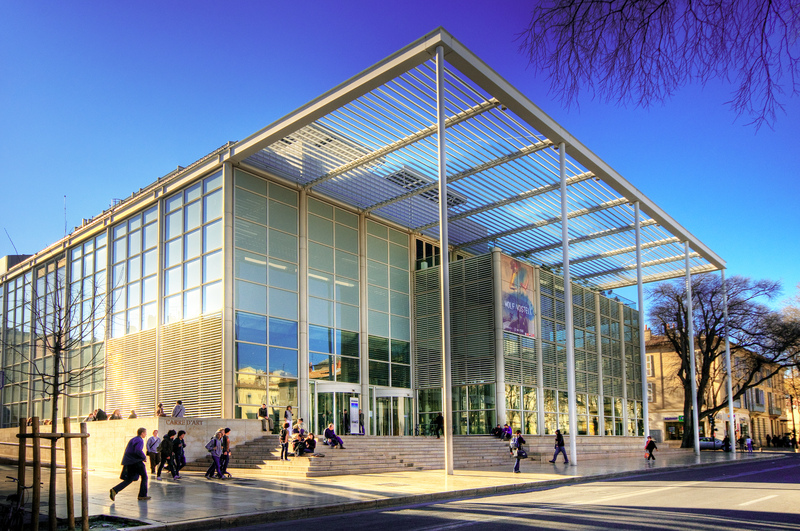 We see not only dialogue happening, you know, within Roman buildings themselves, in Rome itself and in various parts of the world, but this ongoing dialogue between ancient monuments and modern buildings in cities like Rome–the Ara Pacis in the Meier building is one example–but also in some of these other cities, like Nîmes in the south of France. And, by the way, you can go up — there’s a roof garden that you can go up to, on the top of this, of the Carrée d’Art, in order to see a spectacular view from above of the Maison Carrée. Now one of the most important elements of the Romanization of the Empire was the fact that as the Romans went in and built these new cities, in East and also in West, they supplied it with amenities that weren’t there before. And this was especially important in the western provinces where again the civilization had not been all that high, prior to this period. So the Romans come in and they build aqueducts with a vengeance in the western provinces, in the south of France, in Spain, in order to provide these towns with a water supply. 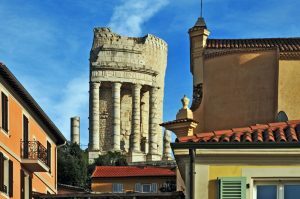 And I want to show you a couple of examples of our best preserved and most spectacular Roman aqueducts anywhere in what was the ancient Roman Empire. I want to begin with certainly the most famous of these, the so, the Pont du Gard, also at Nîmes. And I show you first a map, which gives you a sense of what was going on here. 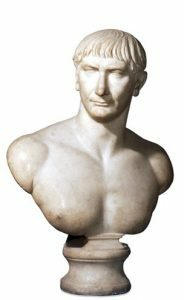 The patron, by the way, of the Pont du Gard at Nîmes was none other than Marcus Agrippa: Marcus Agrippa whom we’ve talked about several times this semester, the close friend, confidant, right-hand man, son-in-law, hoped-for heir of Augustus, who we saw was building buildings in Rome. He built the baths that bear his name, the Baths of Agrippa, and he also built that first Pantheon, that first temple to all the gods, with its caryatid porch. 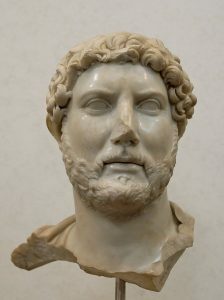 We saw that he was active as a builder in Athens, where he built the Odeon of Agrippa, and where he was honored with a statue on top of a pier on the Acropolis in Athens. 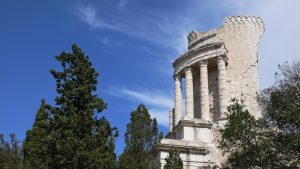 He also was active in the south of France as a great builder, and it was here that he was responsible for commissioning an aqueduct that would bring water from thirty-one miles away, up in the mountains, down to the city of Nîmes. And this map gives you a very good sense of exactly how that was done. 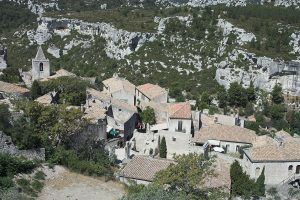 The source was up there, at the top, the top pink circle up here, made its way all the way down to the city of Nîmes here. 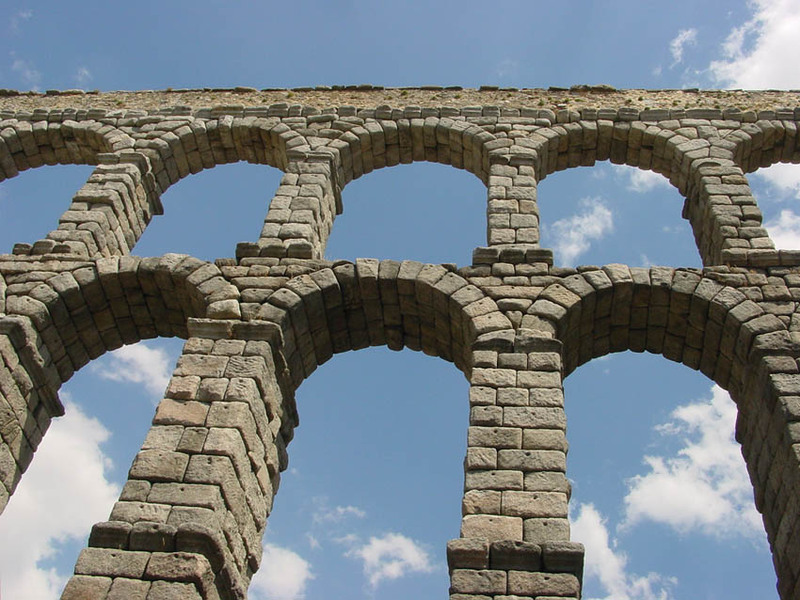 Now the Romans were very clever about how they built aqueducts. They let gravity and the change in terrain essentially do the work for them. They placed terracotta pipes underground, for the most part, on sloping ground, and allowed the water to come from the hillsides or the mountains down into the city, just as they did here. On occasion they allowed those terracotta tubes to be carried by low walls. But sometimes they got to a point where they had to cross a body of water, and that is exactly what happened here. The River Gard of the city of Nîmes, of the area of Nîmes, goes through–is located at this particular point, and so the aqueduct system had to cross the river. How did they do that? They couldn’t tunnel it underground, they couldn’t place it on a low wall, so what they did was build a bridge; they built a bridge to carry that water across the body of water. And the result of that is what you see here. This is the famous Pont du Gard at Nîmes. This is the bridge that serves to carry the water across. They place the terracotta pipes in the aqueduct itself, and that water is carried across that aqueduct. Now what’s particularly extraordinary about this monument, besides that feat of taking that water across the river, is the fact that it is–well if you look at the building technique, you can tell that it is made of ashlar masonry; ashlar masonry that is local stone, in this particular case, as we have seen is the case, for the most part, in architecture in the south of France, in the Roman period. 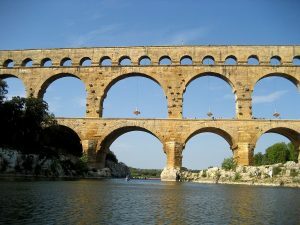 But what is amazing about this particular aqueduct, besides this great engineering feat, is the fact that the architects have paid enormous attention to the exact measurements, not only of the arch itself, but of the arcuations. And they have worked up all kinds of elaborate mathematical theorems in order to get to the point where they play these shapes, and the sizes of these shapes, well off against one another. The larger arcuations below are perfectly mathematically worked out, so that they work well with the smaller ones up above. And we see in a building like this, I think, something that is really impressive: not only a sign of Romanization–I mean this is–when you talk about Roman imperialism and the Romans taking over the world in ancient Roman times, one could think about that, in part, in a negative way. I mean, imperialism and taking over and creating an empire can be viewed negatively. But one of the positive things that the Romans brought, one of the many positive things that the Romans brought to these under-developed parts of the world, was what we call Romanization; bringing these amenities, bringing things like water to a city, so that it could live at a higher level than it was able to live before. But besides that, when you look at an aqueduct like the Pont du Gard at Nîmes, I think you’ll agree that although we would call this a feat of Roman engineering, first and foremost, the Romans have been adept enough, both through paying attention to these mathematical considerations, but also to carving the stone, to making the stone really work aesthetically, that they have essentially, in this aqueduct, transformed engineering into architecture, into what we would define as architecture. I want to show you two other aqueducts. The first–both of them in Spain–the first at Tarragona and the other one at Segovia. 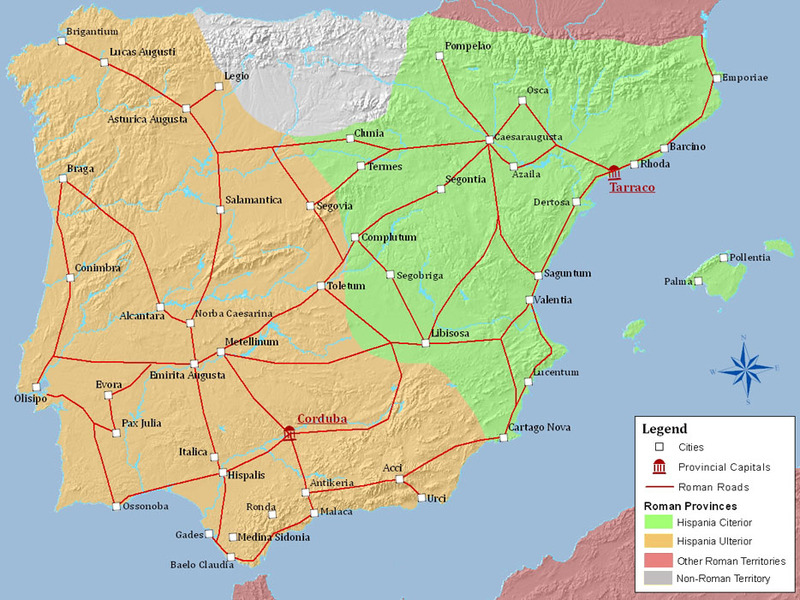 First a reminder of the fact that Spain, as you’ll recall, was extremely important in the Roman period because two of Rome’s emperors came from Spain; think of Trajan, who was born in Spain, and also Hadrian. 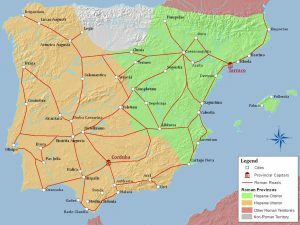 A map of Spain showing the locations of Italica, where Hadrian was born, but also the two sites that we’re going to look at, Tarragona, Tárraco, which was located very close to Barcelona, near the sea, as you can see here, and then further inland Segovia; Segovia which is near Madrid, the city of Madrid. 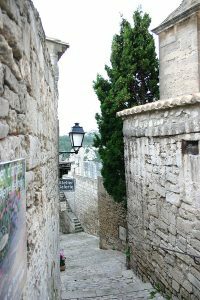 So very accessible; for any of you traveling Spain, these are sites that are extremely accessible, and especially Segovia, well worth looking at. 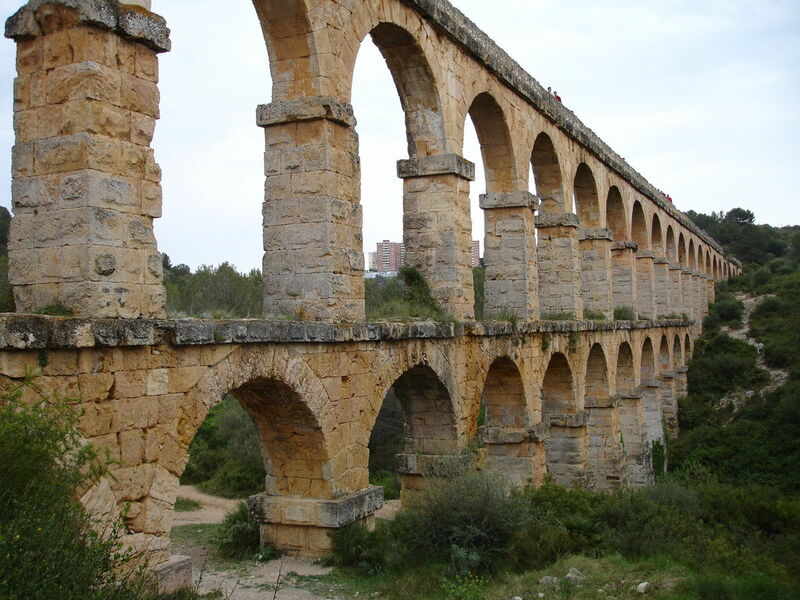 I just want to show you the aqueduct at Tarragona briefly. 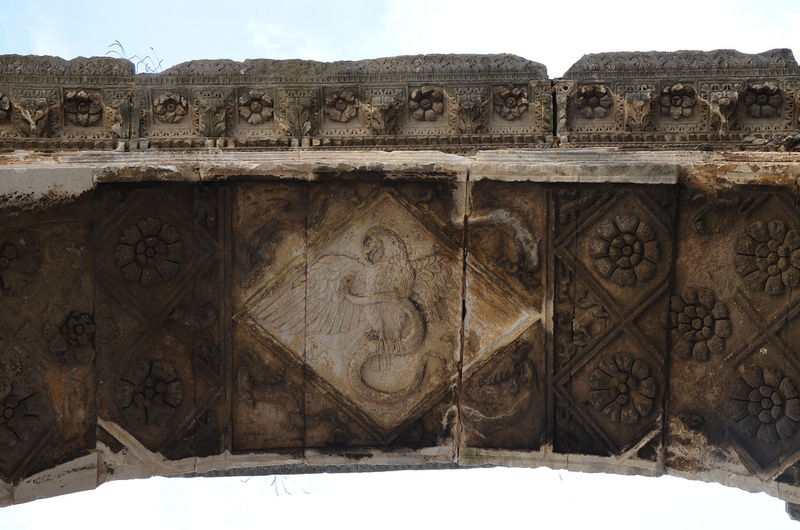 You can see it above, an aqueduct that dates to the Augustan period. And it’s a handsome work of architecture. It has ashlar blocks, as you can see: local stone. But it doesn’t have the finesse. I think you can see here now how great the Pont du Gard is, because it doesn’t–it’s attractive, it does the job, it’s a great engineering feat–but it doesn’t have the aesthetic values that the Pont du Gard does, with its arches that are the same size, on the lower story, and then in the upper story it doesn’t have the appeal aesthetically, visually, that the Pont du Gard does; but it does its job. 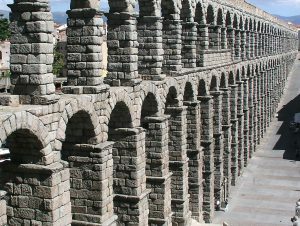 However, the aqueduct at Segovia is quite another story. 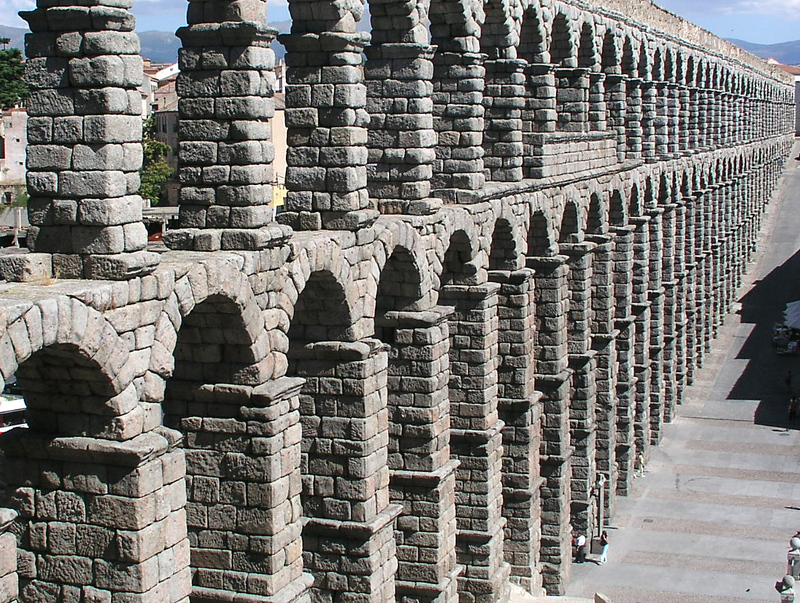 The aqueduct at Segovia is right up there with the Pont du Gard at Nîmes as one of the great works of Roman engineering and of Roman architecture. And what makes it all the more spectacular is how much of it is preserved. 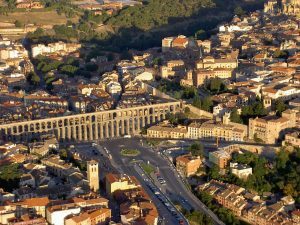 And I think you can see that extremely well here, in this amazing view of the aqueduct making its way across the center of the city of modern Segovia, in this truly spectacular image. 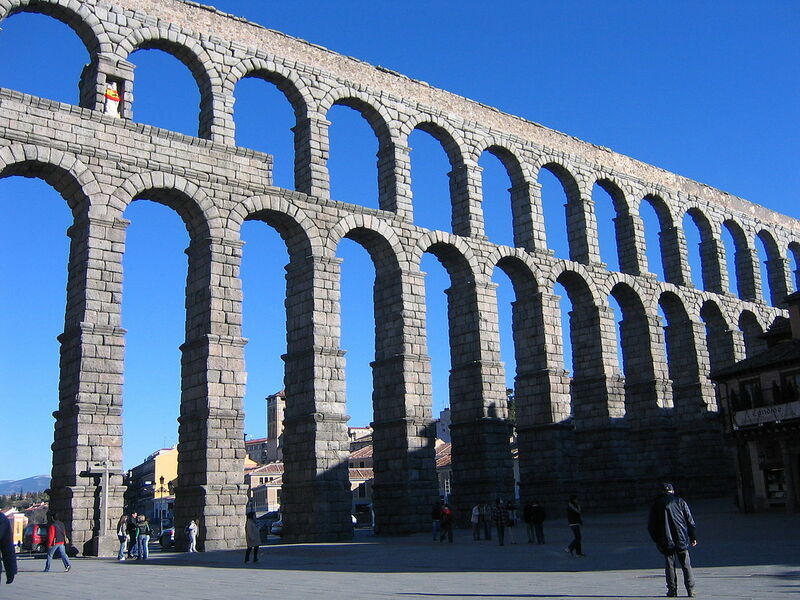 The date of the aqueduct at Segovia is very controversial. There are some people who think it’s first century; there’s some people who think it’s second century. 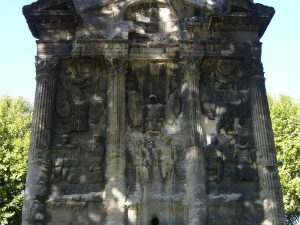 I think it is most likely to be second century, and probably put up during the time of Trajan, the emperor Trajan. But we’re not sure about that. 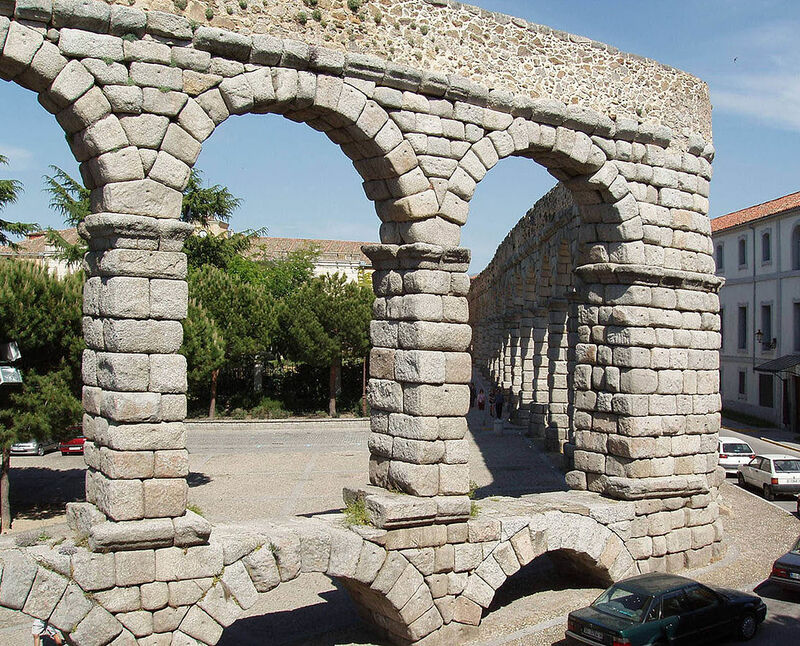 Whenever it was put up, it is an incredible example of aqueduct engineering and aqueduct architecture. And it does allow us to see a couple of things that we–it’s very distinctive in its own right; it’s beautiful, but beautiful in a very different way, as we see from the Pont du Gard. But it does allow us to look at a couple of other features of Roman aqueduct planning and design that I think are worth talking about. I show you here another view of the aqueduct at Segovia, and you see here that it is for the most part a two-tiered aqueduct system. But what they’ve done here to vary it, and to make it much more interesting aesthetically than the aqueduct at Tarragona, is to make those two stories different in height. So the lower story is much higher, as you can see, with much more attenuated arches; and then the upper tier is lower, with much smaller arches. The other thing that they’ve done — using local stone — they have left the stone in a somewhat rougher state. It isn’t quite as rough, perhaps, as Claudius’ buildings–but left in a fairly rough state, which gives it a real sense, as you look at it, of the texture of that stone, of the materiality of that stone, in a way that makes this particular building extremely attractive and impressive. And you can see here–this view is also very helpful because you can see people standing below which gives you some sense of the very large scale of this particular aqueduct. Here’s another view. 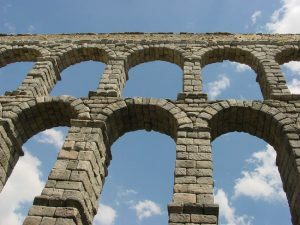 This is one of my favorite views of the aqueduct at Segovia, because I think here you can really get a sense of the coloration of the stone, of the texture of this slightly rough stone, and of the way, even in the architecture of aqueducts–again mainly, an aqueduct is built mainly for a practical purpose, to bring water from one part–one place to another place, to provide an amenity, as we’ve talked about it, a significant and important day-to-day amenity. But even with that, even though it is essentially a practical building, aesthetics are never far from the Romans’ minds. And when this particular aqueduct was designed, not only did the designer have in mind the texture of the stone and the way in which the light of Spain, this particular part of Spain, hits that stone at any given time of day, but the whole concept of vista again. When you wander along this particular aqueduct–because it goes on for quite awhile; you can do that, and you’re not on top of a body of water as well. So you can walk along it down below and see what you see as you meander through it. And it is amazing aesthetically again how they have set up a series of views and vistas, from one part of this aqueduct to another. As you stand here and you look at it, making its way, almost marching its way–in fact, I like to think it’s Trajanic because it’s almost like Trajan’s army marching through the city of Segovia, off to some military exploit in the far reaches, because–the way it marches through the city, as you can see here. But all of these wonderful views and vistas and panoramas that one can see, depending upon where one stands in the city, where one stands beneath the arches themselves, is really spectacular, and clearly was very much in the minds of the architect who designed this. Here’s another very good view where if you stand below the aqueduct and look up, this is the sort of view that you see, with the rough stones, even in the vaults of the arches themselves: an incredible work. And again, the fact that it is as well preserved as it is, is really something to be grateful for. Here’s a very interesting view, because it also shows you what happens with aqueduct design when the terrain changes. So in the center of the city–in the views that we looked at just before–they were able to build, the ground level was low enough, that they were able to build the aqueduct in two stories, with that very high first story and then the lower second story. But what happens when the terrain shifts, when you go–because again they’re taking advantage of a source that is located higher up, with the hope that gravity will do the work for them and allow that water to flow from that source, down into the city. And that is exactly what they did here. The source is farther away and it’s high. So the water has to be piped into this structure and make its way down from the hillside to the city. So you see the ground rising here, to go up that hill. And what happens is that they have to adjust the aqueduct according to the changing terrain. So if you look at this particular section, you will see that the bottom story is just an arch. The arch rests on the ground, so that they–because it has to be much shorter at this juncture than anywhere else. And you see the same–well you see it changing somewhat here, as it makes its way. But you see it rounding the corner, and the way they have had to make these adjustments, and made them so well, without losing the impressive aesthetic quality of this particular structure. Once again, a tribute to the fact that these Roman architects were not only great engineers but also, without any question, world-class architects. There’s an interesting monument that is located–you can see the aqueduct of Segovia in the back left there–there’s an interesting monument that was put up to celebrate the bi-millennium of the aqueduct in Segovia. 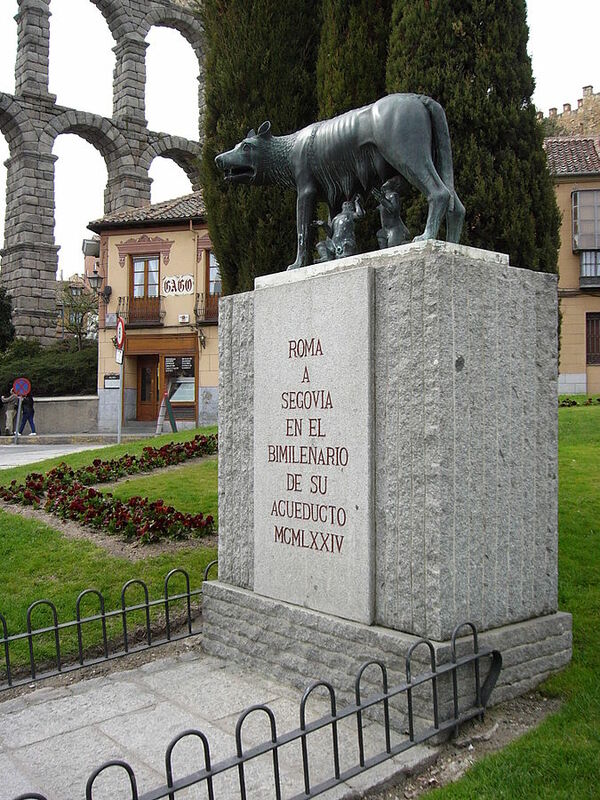 And it’s interesting to see what they put at the top: the she-wolf suckling Romulus and Remus to underscore the close connections between ancient Roman Segovia and Rome. Another very interesting building in France is the one that I show you now, which was a fountain. 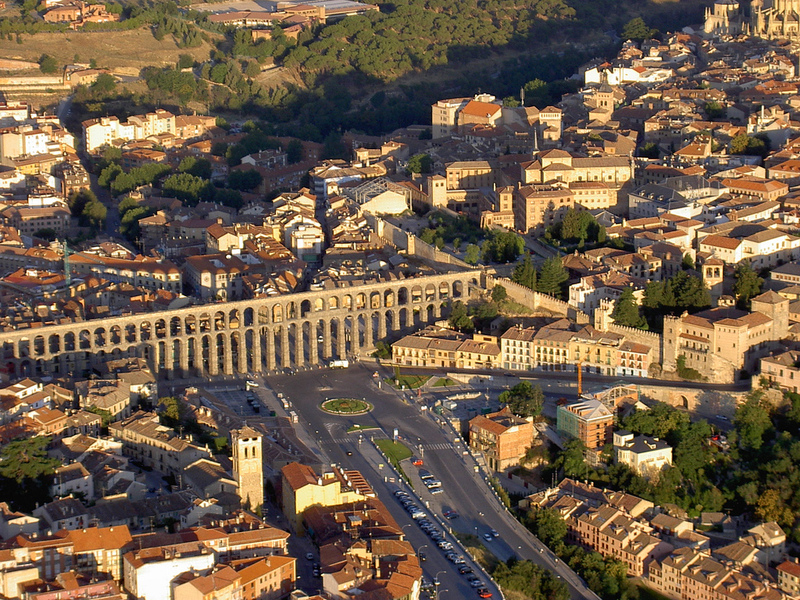 These aqueducts brought not only water for daily use but fed fountains. And I want to show you one fountain from Roman Gaul, from what is France today, the so-called Temple of Diana. 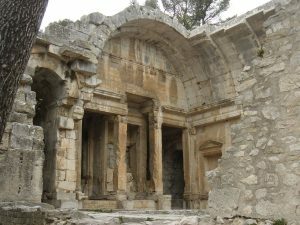 It wasn’t a temple, it was a fountain, as I mentioned, and it was built during the Hadrianic period, between 100 and 130. What makes this fountain particularly interesting is if we just looked at this–if I asked you, if I put this up and said to you: “What do you think this was?” you would be unlikely to say a fountain; because you can see that this structure is in the form of a basilica. It’s a barrel-vaulted central chamber, with side aisles that are also barrel-vaulted. You can see the barrel vault of this side aisle over here. You can see a barrel vault of the central space here. You can see that there are columns on tall bases. You can make out, over here, a triangular pediment on top of a niche. There were a series of niches along the wall, with alternating triangular and segmental pediments. But most interesting of all is the central space, the central barrel-vaulted space, with these barrel-vaulted side aisles, which is exactly the scheme of a typical basilica. And it’s another example of something I’ve shown you throughout the semester, that I’ve called the interchangeability of form; the way in which certain building types, in this case a basilica, built initially as a civic structure for the trying of law cases, becomes a plan that is used in other contexts; whether it’s in residential architecture, as we’ve already seen, and in this case in the form of a fountain. So that’s particularly interesting. Also interesting is the fact that although this is a barrel-vaulted structure, it is made entirely out of local stone — no concrete whatsoever in this particular part of France. No concrete, stone construction. It’s a masterwork when you consider that this was all done out of stone, and done extremely well. Look how smooth the stones are. And look, the designers have even been talented enough to create ribs, with stone, in that stone barrel vault, for this amazing structure. And you should be reminded, when I talk about the interchangeability of form, of the underground basilica that we looked at way back when, in the time of Claudius, which was built underground, made out of concrete, faced with stucco, as you’ll recall, but used for a secret sect, and in this case the use of this basilican structure for a fountain in Roman France. Up to this point we have looked at monuments that were made possible by Rome’s subjugation of this particular part of the world; the subjugation we know of at least forty-four Alpine tribes. And so while all of these buildings that I’ve shown you come because of that subjugation and subsequent Romanization of the area, there is one monument, spectacularly sited, that actually celebrates, honors, that very subjugation, and it’s to that that I now want to turn. 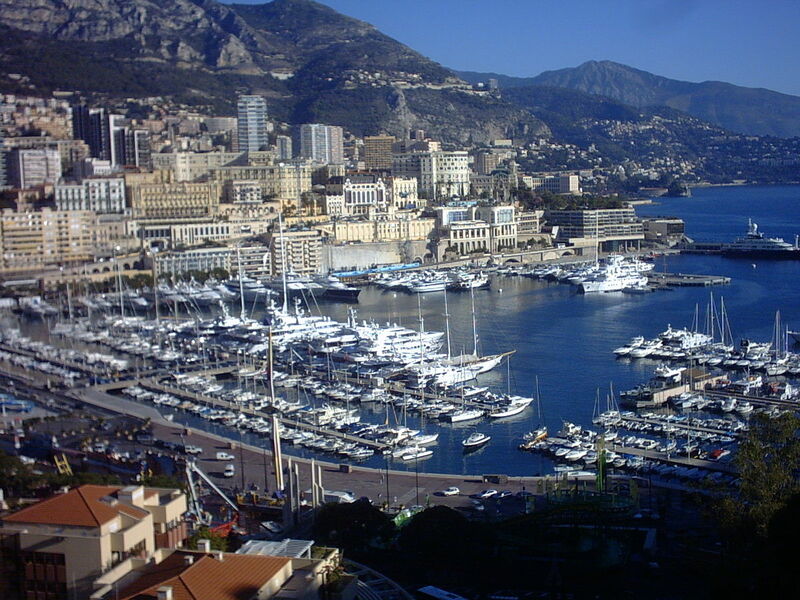 It is, as I mentioned spectacularly sited, along the French Riviera, not far from Nice, not far from Monte Carlo. You see it here. It is the Trophy of Augustus, the Tropaeum Augusti, that is located in a town called La Turbie and you can see it rising up in the midst of modern La Turbie here. It dates, we believe, to 7 to 6 B.C., and thus in the age of Augustus, and celebrates, quite specifically, Augustus’–and the inscription tells us this–Augustus’ subjugation of forty-four Alpine tribes in this particular part of the world: a monument put up to honor that victory of Augustus. So essentially a trophy monument. You can see that it is only partially preserved. And I show you here a view of it down the street, the modern street, as it looks today, where you can see it rising up over that street. And if you look very carefully, you will see that the stone that the structure is made out of is very similar–in fact exactly the same–as the stone used for the local houses. 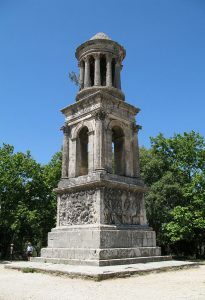 Now this is very interesting, because what–the monument did not look–even though it’s only partially preserved today, even less of it was preserved earlier on, and it was in the 1930s that an American patron decided that he wanted to reconstruct, as best that could be done, the Trophy Monument at La Turbie. Because there was recognition that the monument at La Turbie had served as a quarry, essentially for the local inhabitants, and that over the years they had been taking the stone from the Victory Monument of Augustus, and using it–that’s why it’s the same stone–using it in their houses. And this American wanted to rectify it, so he donated the funds that enabled them to tear down, to demolish, thirty-two houses, and come up with 3000 fragments from the Victory Monument, the trophy at La Turbie, and reconstruct it as best as they could from those fragments. And that’s what you see there now. Her is a model. And what you can see from both this and the above images is not only the inscription and the trophy in relief, on this side, that mentions the forty-four Alpine tribes, but the monument itself. 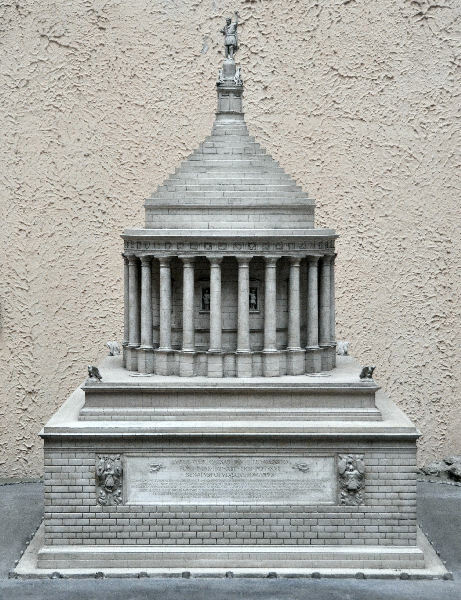 And this model makes it very clear what the general form was: a round structure, with columns encircling it, on a base, and then the whole thing placed on a very large–a tall pedestal, with a pyramidal element at the top, and a crowing statue at the very apex. 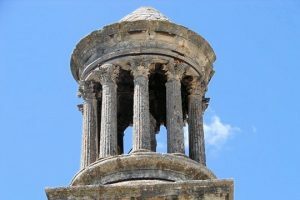 This scheme of placing a rotunda on top of a tall base is something that we have seen as characteristic of funerary architecture, from the age of Augustus. 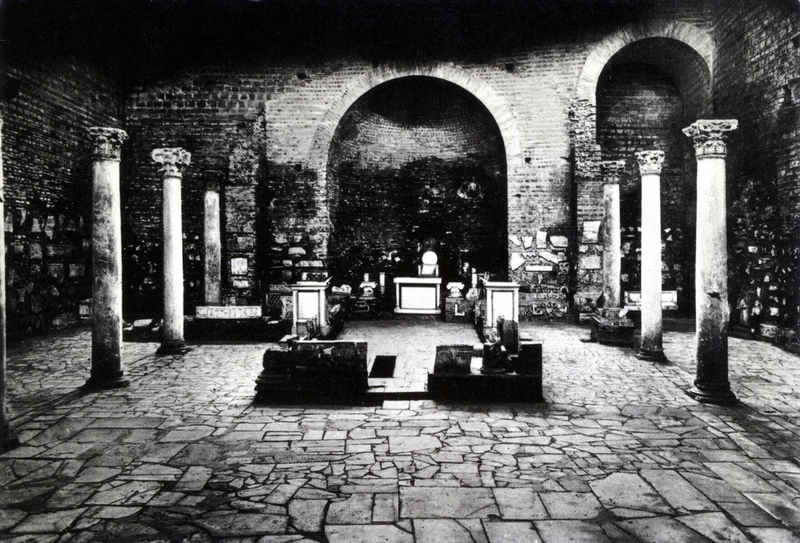 Think of the Tomb of Caecilia Metella, for example. And it is that scheme that is used here. So another example of this interchangeability of form — that a form that was used for mausoleum architecture now used for a trophy monument, of the same time, but in a different part of the world. The model also shows you that there were niches around the central circular structure. Those had in them portraits of Augustus’ lieutenants, who helped him placate this particular part of the world. And then at the top of the stepped pyramidal structure, a portrait, a bronze statue of the emperor Augustus himself. Here’s a detail of the Victory Monument at La Turbie, with all of those stones from those thirty-two demolished houses reused here to reconstruct it. There is concrete used here, but it’s a Gallo-Roman form of concrete. 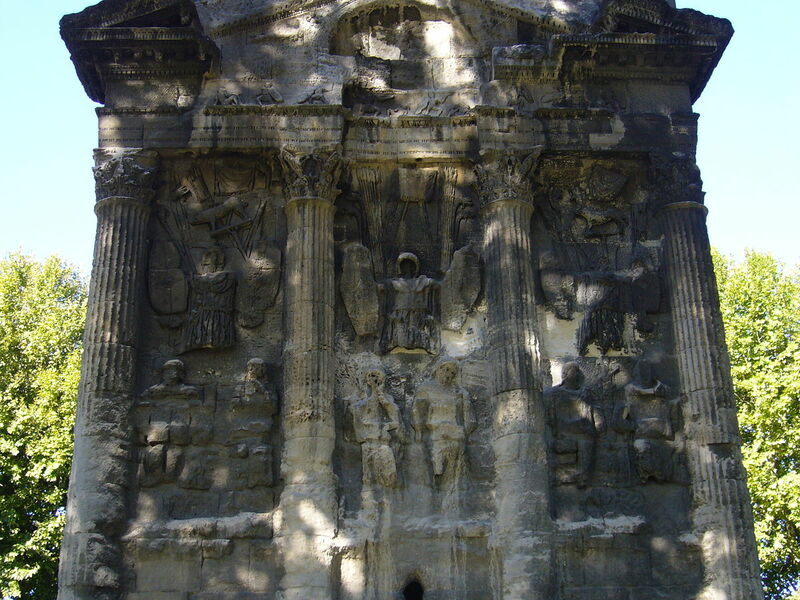 This work is referred to as petit appareil, which is essentially a Gallo-Roman version of concrete construction, with stone facing, little work, little pieces of stone, that are very similar to opus incertum, but different enough and distinctively French enough to be called petit appareil. 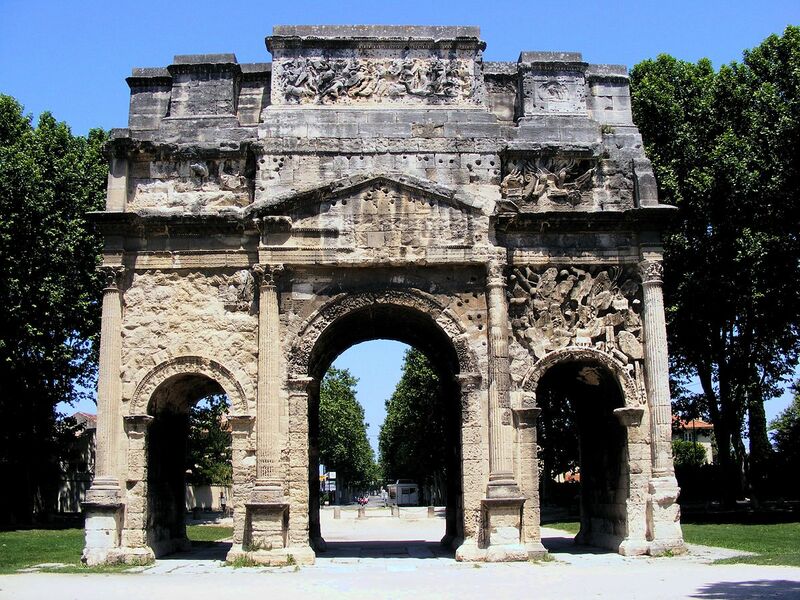 The victories, Augustus’ victories and pacification of this part of the world also led to the construction of arches. And I want to turn to a couple of those now. 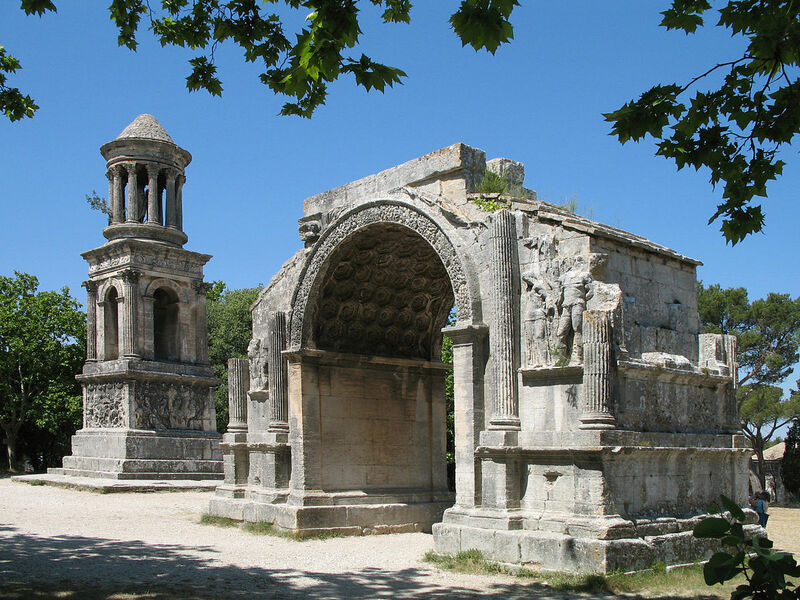 The Arch at St. Rêmy, also in the south of France. You see it here. 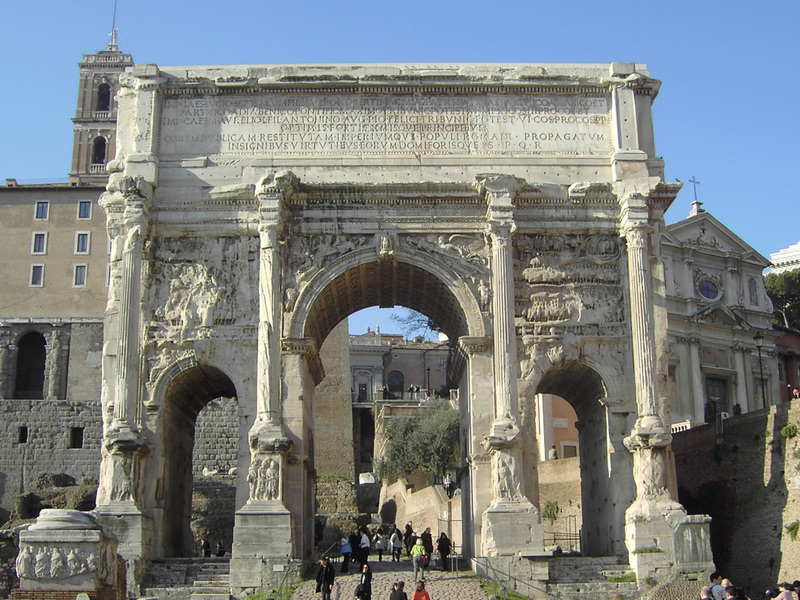 It dates to around 20 B.C., and it probably served as both an arch in honor of these victories that Augustus celebrated here, but also as a gateway into the city. It’s very simple. It looks very much like we’ve come to know Augustan arches are, with a single arcuated bay in the center, columns, in this case, on two separate bases, fluted columns. 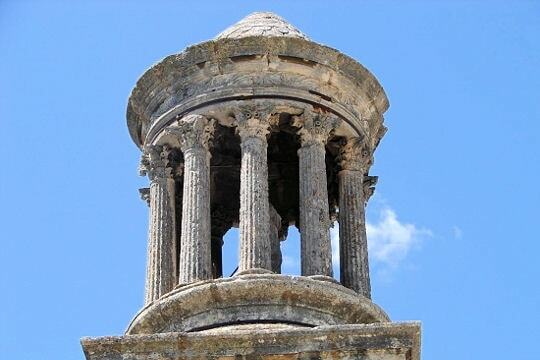 The capitals are not preserved, so we don’t know if they were Corinthian, but they were probably Corinthian. A very elaborate archivolt, as you can see here, with the coffering extremely well preserved. And then if you look very closely at the decoration, you see a couple of figures standing on either side. These are actually–they’re headless now–but they’re actually figures of captives; of captives, of local captives, to make reference again to the fact that this was military, a military operation, that allowed Augustus to take over, to subjugate these forty-four Alpine tribes, and others in this particular area, and that that subjugation is referred to here by the representation of those captured barbarians. A much more important and more interesting arch is this one. 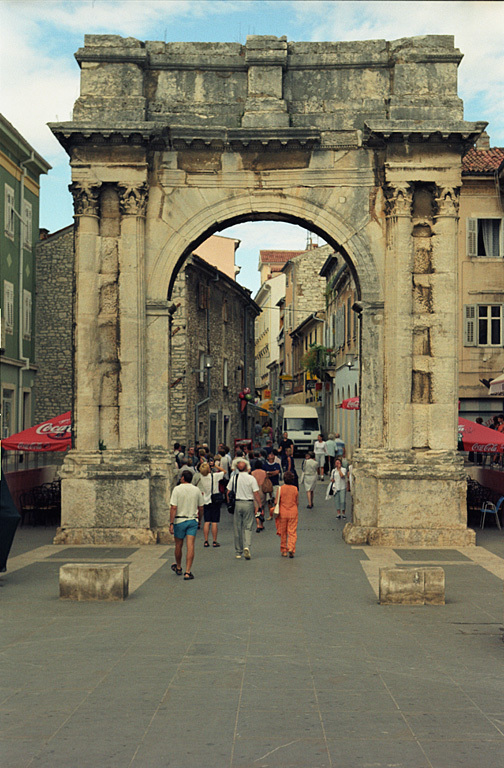 It’s an arch that is located in Orange–back to Orange–also in the south of France. The date of this monument is very controversial, and I think by looking at the general view, and also a detail, you can see why. 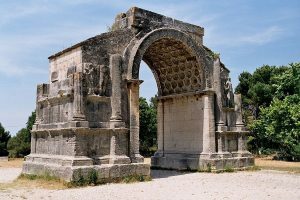 It is a triple-bayed arch, with a large central arch, two smaller ones on either side, with columns on tall bases, Corinthian columns in between them. 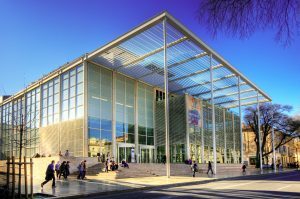 You can see that the central element, with its pediment, projects into the viewer’s space. You can also see that every inch of space is completely covered with decoration–figural decoration, piles of arms and armor from the enemy–so much so that it tends to dematerialize the arch. 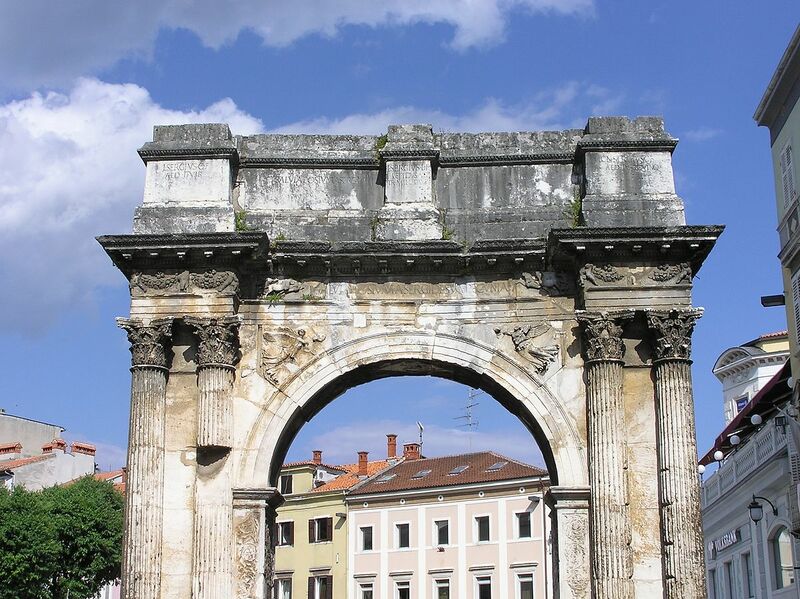 These are all characteristics of later Roman architecture–think the Arch of Septimius Severus, which has led some scholars to date this as late as A.D. 200 or A.D. 203, 204, at the same time as the Arch of Septimius Severus. 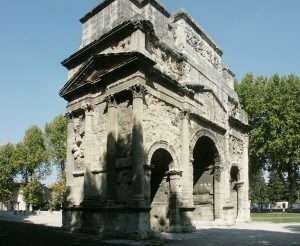 And it was long thought to be that also because no one could concede that this idea of the triple-bayed arch could turn up in let’s say Augustan or Tiberian France, Gaul, before it turned up in Rome. So getting back to that issue I’ve raised on several occasions about center and periphery. Does everything flow from the center, or are forms sometimes developed in the periphery and then make their way back into the center, is an age-old and very interesting question to ask. But I think you can see the reasons why scholars, some scholars, have dated this to the Severan period. Here’s a detail of the attic relif, which shows you an interesting battle scene where the figures are very heavily outlined, as you can see here, which is unusual. Scholars have suggested, and I think correctly, that the reason for that is that these artists, in this part of Gaul, were probably working from copy books, or copy scrolls I guess I should say: drawings of battle scenes, typical Greco-Roman battle scenes, that they could use–Hellenistic battle scenes perhaps, or early Roman battle scenes–that they copied. And these were drawings, and consequently they copied them quite exactly, by showing the outlines around the figures. It’s a speculation, but I think it’s an interesting speculation, in this very frenzied battle scene from the uppermost part. One other detail. If you look at the side of the arch, you see an arcuated element inside. You can barely see the triangular pediment, but there’s an arcuation inside an unbroken, a complete triangular pediment. So that scheme of placing the arcuation also tends to be a late feature. However, scholars who’ve spent a lot of time looking at the sculptural decoration of this monument, at the piles of arms and armor that one finds there–which, by the way, includes piles of arms and armor from a naval victory, which is interesting, as well as piles of arms and armor from victories on land, which has made some scholars speculate that this refers to a kind of generic victory, to victory on land and sea, by whomever this honored. But very interesting is the fact that there is one armament that is inscribed with the name Sacrovir. Sacrovir we know was someone who was living and active in the time of Tiberius. He led a revolt in this part of Gaul, in A.D. 21, against the local Roman governor and his excessive taxes. 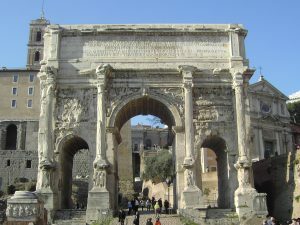 And it has been speculated that that Sacrovir, who is mentioned here, is that very same Sacrovir, and that it is very conceivable therefore that this arch was put up in the time of Tiberius. I’ve given you a date of A.D. 25. I believe that myself, although it does defy imagination, to a certain extent, to think of an arch, with all of these features that I’ve described today, as early in the south of France as A.D. 25. But it’s something for you to think about in terms of our whole question of the relationship between center and periphery. I want to show you the last group relatively quickly, just to dip into Istria, as I said I would, to the uppermost part of what is today Croatia, to look at one more arch, in a different part of the Roman world, but during the same period, the end of the first century B.C., an arch at Pola. I show you the location here of Pola, or Pula, at the very uppermost part of Croatia, very close, exactly at, I mean it’s just–when I went there once, you literally, you go across the border and there you are, the Italian border, you’re in Pola. And you see the rest of Croatia here, with the other great site of Split, and of course the famous city of Dubrovnik at the base. You see the arch extremely well preserved. 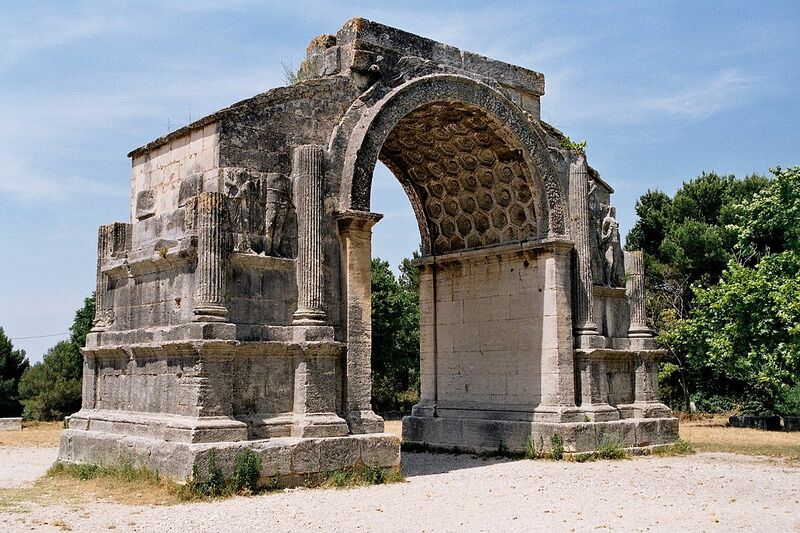 Another typical Augustan arch: single bayed, two columns, Corinthian order, on a shared base. If you look at the attic, the attic is interesting. Local stone once again. Look at the attic, you’ll see bases that are inscribed at the top, and those bases are very helpful in terms of telling us something quite extraordinary, and that is that this arch was put up by a woman. We know her name: Salvia Postuma. 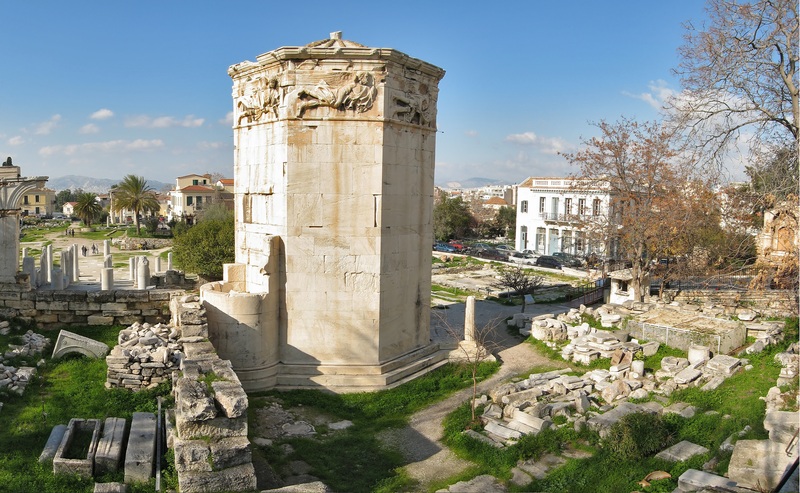 Salvia Postuma, who put this monument up to three male members of her family, who were involved in military operations at this particular time, died, and then were honored by this monument. I show you a reconstruction of what the uppermost part probably looked like when there were statues of those three male members of the family, possibly in their military costumes, although we don’t know for sure, at the apex of the structure. You see victories in the spandrels; you see the Corinthian capitals; you see cupids carrying garlands; all the kind of decoration. You see some acanthus leaves, very much like those in the Ara Pacis: all the kinds of decoration that have been transported from Rome to be used, in this case, in the north of former Yugoslavia for this arch. We see the Corinthian capitals here. We see the victories here. We see the cupids with the garlands over there. We see a chariot scene here. 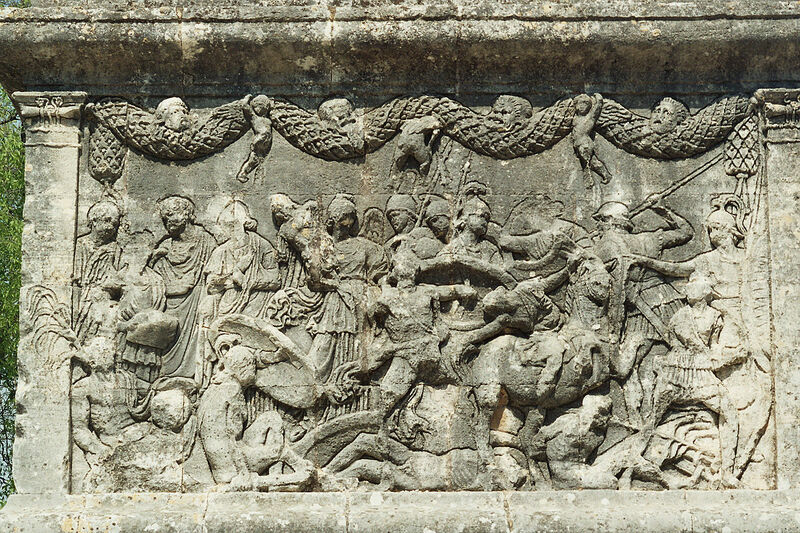 The chariot scene is an interesting reference to the race of life, a reference to victory in athletic competition, as well as victory over–you see the bucrania there also; clearly another touch of Rome, of the Ara Pacis. But this interesting, the close correlation in the minds of the Romans between victory in battle, victory in athletic competition, victory in the hunt, and also victory over death. And all of that comes together well in the arch here. If you look up into the vault, it’s very well preserved. 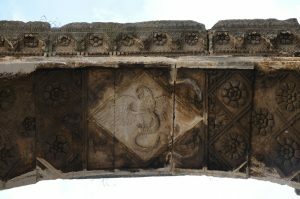 In the center a representation of an eagle, with a serpent, holding a serpent; this is probably a reference to death and rebirth. 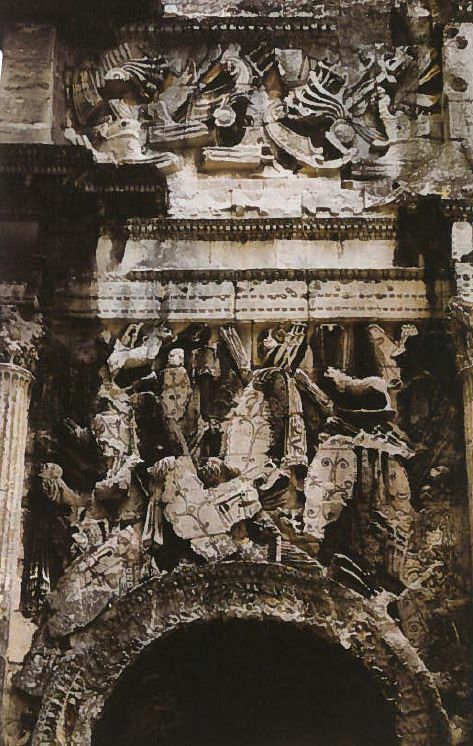 And remember, this is Augustan in date, so it predates the vault of the Arch of Titus in Rome. But this whole idea of placing in the vault a scene of death and rebirth, leads ultimately, I think, to that divinization scene of Titus. 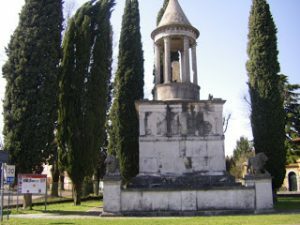 I want to take you very quickly to show you an important tower tomb in the city of St. Rêmy–we’re back in the south of France–St. Rêmy, the ancient Glanum, which was a very highly developed town, also in the Greek period. So here we see some overlay. We have local Celtic custom. The Greeks infiltrated here, then the Romans; all of that piled one on top of another, to make a very distinctive city. You can also see from the remains, there are extensive remains at Glanum, more than most of these ancient French towns, where you can see baths and temples and parts of houses and peristyles and so on, quite well preserved. I show you here, for example, some honorific bases and altars. 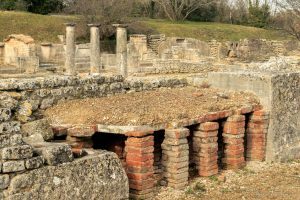 There is also a hypocaust from one of the baths, looking very much like a hypocaust we would see in Pompeii of like date. 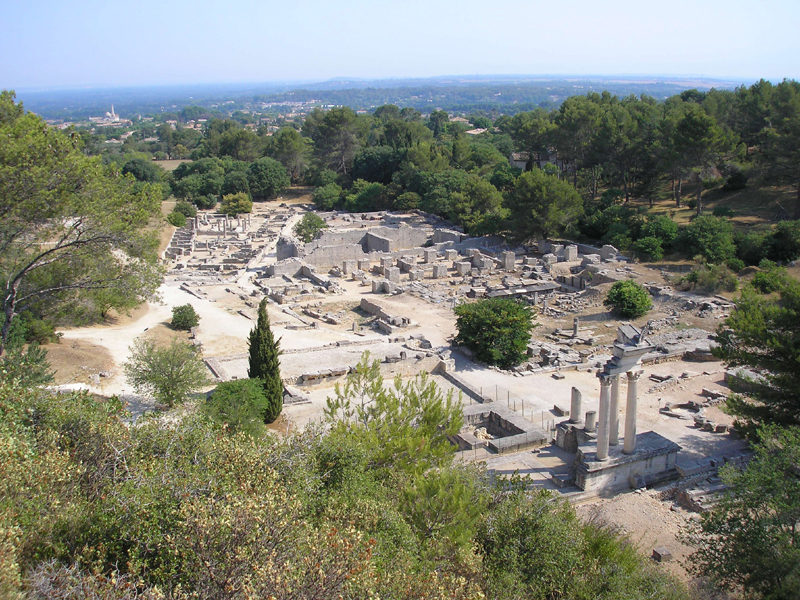 I also want to mention, in case any of you are making your way to the south of France anytime soon, it is located, the city of Glanum, located very close to the wonderful town of Les Baux; in fact, Glanum is in the shadow of Les Baux, that lies in the mountains on the top. A fabulous place to just–nothing to do with Roman antiquity but just a great place to wander, as you can see here, and every one of the caves, and there are a lot of them, have places for wine tasting. So it’s a fun place to go. This is the tower tomb. These are referred to by the locals as Les Antiques, Les Antiques; the arch–the antiquities–the arch and the tower tomb. And the fact that they are in close proximity; I mentioned the arch may well have been a city gate. The Romans always buried their dead outside the city gate. City gate, cemetery right outside. Extremely well preserved. Tower tomb, tower tomb because it’s taller than it is wide. 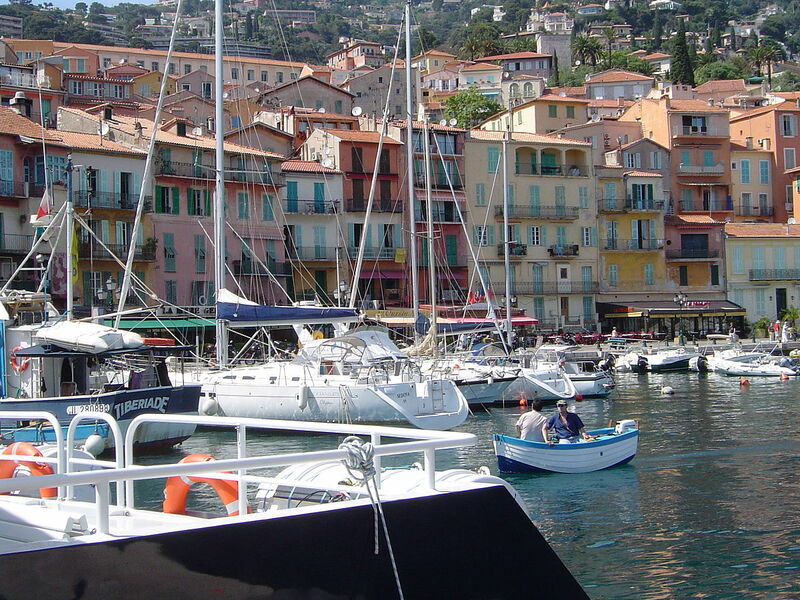 This area of France is particularly famous because of Vincent van Gogh, one again. Van Gogh spent his last years in an insane asylum, as many of you may know, in St. Rêmy. This insane asylum–which you can see; this is a Van Gogh painting of that asylum in which he spent those last days–is located exactly across the street from Les Antiques. 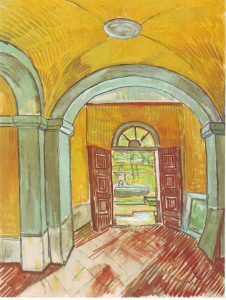 So if you make the pilgrimage there, I hope you’ll make the pilgrimage not only to see Van Gogh, but I hope that you’re aficionados now of–in fact, I hope that you go to see Les Antiques and then also go to see the asylum of Van Gogh. 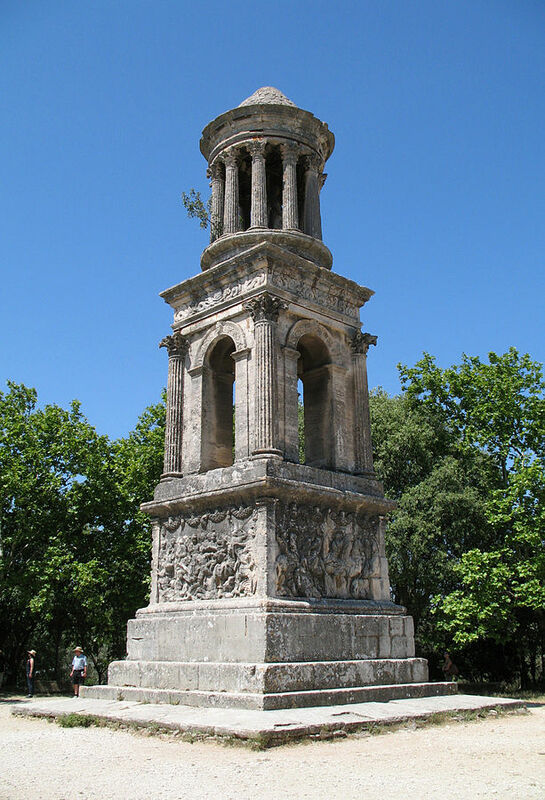 Here’s the monument of the Julii, a tower tomb that was put up in St. Rêmy in 30 to 20 B.C., so the cusp, the late-Caesarian into the Augustan period. 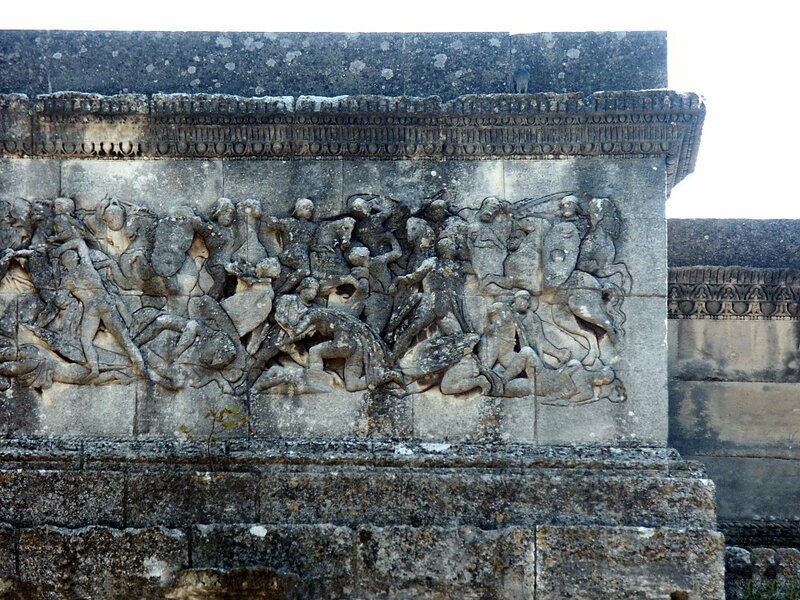 And we think the Julii represented here are in fact veterans of Julius Caesar’s army, who have taken his name. 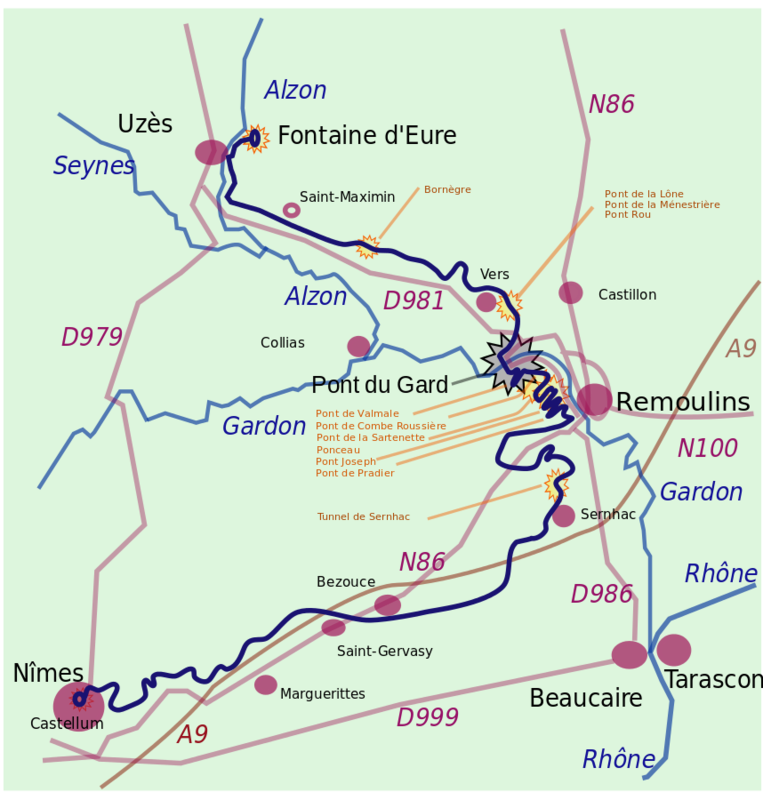 Julius Caesar, all of his great military exploits in Gaul, referred to here by his veterans who have taken his name and have settled here on land that they were given in reward for their good work. 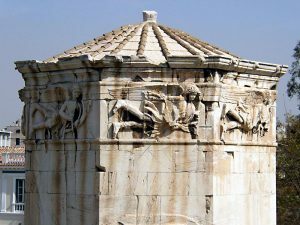 Again it’s a tower tomb; taller than it is wide; a stepped base; a socle with sculptural figural frieze; a quadrifrons up here; Corinthian columns; and then at the very apex a tholos that has two statues inside that tholos. 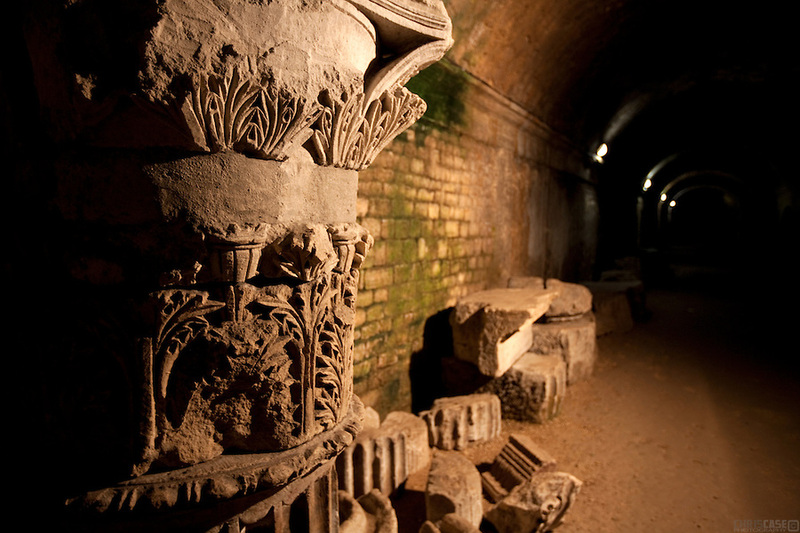 This is pretty much the best-preserved Roman tomb that we have. Everything is intact here. We believe–remember I mentioned way at the beginning that we think that a lot of these Roman ideas came to the south of France via North Italy, and we think this was indeed the case. In North Italy we know they put up a lot of these tower tombs, and we think it’s likely that this sort of thing imitates some of those tower tombs in the north of Italy. 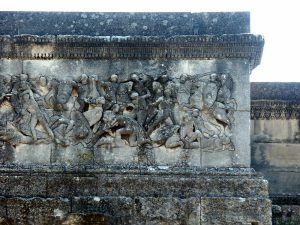 I show you a detail of two of the figural friezes from the socle of the monument, which you can see represent battle scenes. 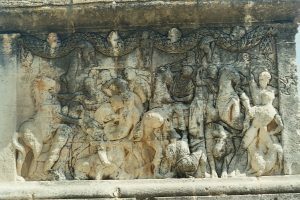 And you can also see those deep outlines, just as we saw at the Orange Arch, which once again suggest to us that these artists are looking at drawings of this kind of thing that come from the Greco-Roman world, and they are copying what they see. I don’t have time to go into it here, but if you look with care at some of these, when you’re studying this monument, you will see that there are some figures–while for the most part it makes sense–there are some figures in this crowded scene that don’t work. For example, here’s a figure on the ground, with a shield above his head, trying to protect himself obviously from a combatant. But there is no combatant there. And that seems to underscore again that they are using copy books, that they are looking at these things. They’re copying what they like. They’re copying the scene for the most part, throwing in some other figures that they like, that don’t–sometimes don’t even make any sense. I spent about six weeks at this monument at one point, in that area at St. Rêmy, in a little place near Les Antiques. And I remember when I was there that there was this wonderful headline in the local newspaper that said–there was a huge storm, with lightening and so on, and the next morning there was a headline that said “Has Gaius Lost His Head?” Because the locals want to believe that this is a monument, not of local army veterans, but of the Augustan family, and that the two figures at the uppermost part were Gaius and Lucius Caesar. Well they were not Gaius and Lucius Caesar, they were local veterans. But nonetheless the myth has continued on. North of Italy may have been a source for this kind of tower tomb that we see at St. Rêmy, just by showing you one example. It’s by no means exactly the same. 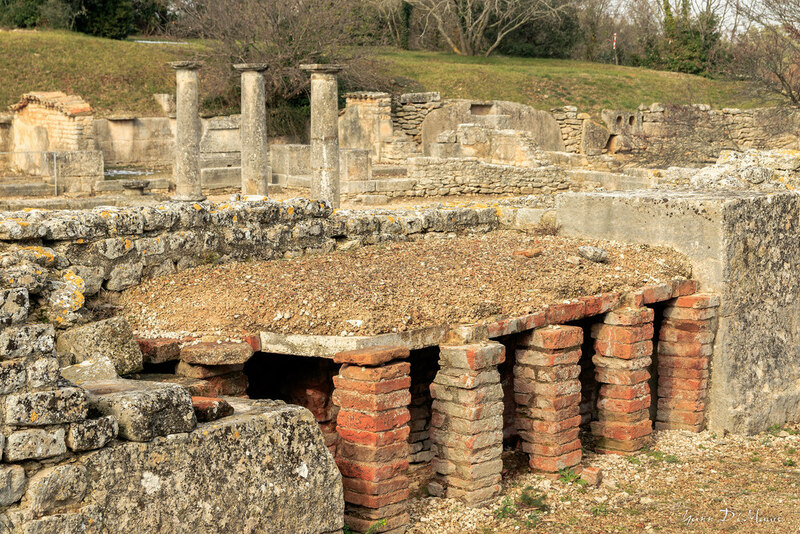 But it is a tholos tomb from Aquileia, in the north of Italy that dates to the early Augustan period. 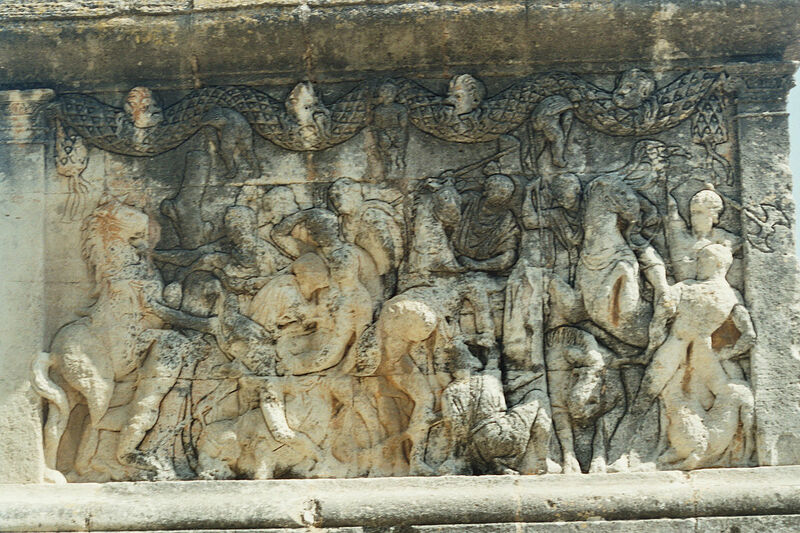 And you can see that it has a large base, with a figural sculptural decoration here–this Isles of the Blessed kind of imagery–with a tholos at the top that includes a statue, and then a pyramidal roof with a decorative element at the uppermost part, and then, as you can see, some lion statues out in front to guard that tomb. It’s by no means the same thing as what I’ve shown you, but it gives you an idea that these kind of tholos tombs, on decorated bases, were popular in the north of Italy, and the idea may have made its way to the south of France via these north Italian examples. And lastly, just one last monument, because we’ve tended to be looking at tombs in isolation, individual tombs, rather than tomb complexes, because it’s the individual tombs and not the complexes themselves that are well preserved. 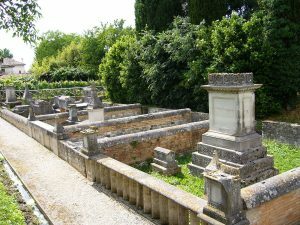 But I want to show you one excellent example from the north of Italy, again from this wonderful town called Aquileia: an early Augustan set of altar tombs that are still preserved in the actual original burial plots, which gives you a very good idea of what one of these plots would have looked like. These are, of course, not monumental tombs but small tomb markers in the shapes of altars, and then other smaller items, as you can see very well here. But it shows you the way in which the Romans had, just as one has today, these burial plots for the family: these family burial plots, that have individual markers of different family members in them, and then has a kind of stone fence that encircles and protects their plot. And you can see that stone fence down here, a stone fence that should immediately remind you of some of the stone fences that we saw in Second Style Roman wall painting, for example; that were omnipresent in Second Style Roman wall painting. And the last point I’ll make today is just to underscore–once again, I think there are lots of examples of it today; the tholoi, for example, the tholos, and these fences, as well as the theatrical architecture we saw at Orange–that underscore once again the close association between architecture and painting, from the Republic, all the way up to the Augustan age, and still beyond.